17 Palestinian civilians, including 2 children and a woman, were killed in the West Bank and Gaza Strip. 106 Palestinian civilians, including 34 children, 2 women and a journalist, were wounded in the West Bank and Gaza Strip. A Palestinian woman was wounded in the southern Gaza Strip. Israeli forces conducted 104 incursions into Palestinian communities in the West Bank and 6 limited ones in the Gaza Strip. 130 Palestinian civilians, including 28 children and 4 women, were arrested. 26 of them, including 13 children and a woman, were arrested in occupied Jerusalem. Ahrar Centre for Prisoner Studies in Nablus was closed and its contents were confiscated. In addition, a Zakat Committee in Bethlehem was raided. Israeli gunboats continued to target Palestinian fishermen in the Gaza Strip sea, but no casualties were reported. 23 Palestinian fishermen, including 2 children, were arrested and 6 fishing boats were confiscated in the northern Gaza Strip. Jewish majority efforts continued in occupied East Jerusalem. 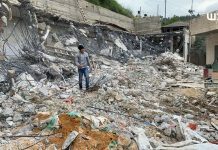 An under-construction building in Sour Baher was demolished. Moreover, premises in the Old City was seized in favour of settlement organizations. Settlers fired 2 gas canisters into a house belonging to a Palestinian family, west of Ramallah and al-Bireh. Dozens of temporary checkpoints were established in the West Bank and other were re-established to obstruct the movement of Palestinian civilians. 13 Palestinian civilians, including 2 children and 3 women, were arrested at military checkpoints. Israeli violations of international law and international humanitarian law in the oPt continued during the reporting period (17 – 30 December 2015). Israeli forces have continued to commit crimes, inflicting civilian casualties. They have also continued to use excessive force against Palestinian civilians participating in peaceful protests in the West Bank and Gaza Strip, the majority of whom were youngsters. Occupied East Jerusalem witnessed similar attacks. During the reporting period, Israeli forces and police killed 17 Palestinian civilians, including 2 children and a woman. 14 of them were killed in the West Bank and the 3 others were killed in the Gaza Strip. Moreover, 106 civilians, including 34 children, were wounded. 59 of them, including 10 children, were wounded in the Gaza Strip while the remaining others were wounded in the West Bank. Concerning the nature of injuries, 85 civilians were hit with live bullets and 21 were hit with rubber-coated metal bullets. In excessive use of deadly force, on 17 December 2015, Israeli forces killed Abdullah Nasasrah (15), from Beit Foreek village, east of Nablus. They claimed the boy attempted to carry out a stabbing, but PCHR’s investigations refute the Israeli story. In excessive use of deadly force as well, on 18 December 2015, Israeli forces killed Nash’at Asfour (34), from Senjal village, north of Ramallah. They killed him after they moved into the said village. Eyewitnesses said that Asfour did not participate in the confrontations erupted in the village. On the same day, Israeli forces killed Mohammed Ayyad (21), from Silwad village, northeast of Ramallah. They opened fire at his car at the western entrance to the village after he run over a number of Israeli soldiers. He was left bleeding to death for an hour. On 23 December 2015, 2 female Border Guard soldiers shot dead Adnan Hammad (21) and Essa Assaf (21), both are from Qalandia refugee camp, north of occupied Jerusalem, after they stabbed 3 settlers at Hebron Gate in the Old City. On 24 December 2015, Palestinian medical sources pronounced Mohammed Zahran (22), from Kufor al-Deek village, west of Salfit, dead as Israeli soldiers opened fire at him. Israeli forces claimed that Zahran carried out a stabbing at the entrance to the industrial zone of “Ariel” settlement, north of the city; therefore, they shot him dead. On the same day, Israeli forces stationed at a military checkpoint established at the south-eastern entrance to Hebron killed Eyad D’aisat (25), from Beit Amrah village, west of Yatta, south of Hebron, under the pretext of holding a screw and attempting to carry out a stabbing. Eyewitness confirmed that the aforementioned person did not attack anyone, yet the Israeli soldiers opened fire at him. Also on the same day, Israeli soldiers stationed at Jaba’ checkpoint near the northern entrance to al-Ram village, north of occupied Jerusalem, opened fire at a Palestinian vehicle. As a result, the driver Wesam Abu Ghwailah (20), from Qalandia refugee camp, north of the city, was killed. Israeli forces claimed that the aforementioned person attempted to run over Israeli soldiers in the place. On the same day, following the killing of the abovementioned person, Israeli forces moved into Qalandia refugee camp. As a result, dozens of Palestinian youngsters gathered and threw stones and empty bottles at Israeli soldiers, who opened fire in response. Therefore, Belal Zayed (25) sustained a bullet wound to the face and was pronounced dead soon after. On 25 December 2015, Israeli soldiers opened fire at a Palestinian vehicle that was traveling by the western entrance to Silwad village, northeast of Ramallah. As a result, the driver Mahdiyah Hammad (40), from the same village, was killed. According to PCHR’s investigations, the aforementioned woman was driving slowly 20 meters away from the Israeli soldiers, who pointed their guns at her car and then opened fire heavily. Mahdiya was left bleeding to death in the car. In a similar crime, Israeli forces stationed at Hawarah checkpoint, south of Nablus, killed Maher al-Jabi (54), on 26 December 2015. On the same day, an Israeli police officer shot dead Mos’ab al-Ghazali (26), from Silwan village, south of occupied Jerusalem. They claimed that he attempted to stab an Israeli police officer opposite to al-Jadid Gate. On 27 December 2015, Israeli forces shot dead two Palestinians carrying knives, as the latter attacked a military jeep on the main road in the centre of Hawwarah village, south of Nablus. The two killed persons were identified as Mohammed Saba’nah (23) and Nour al-Deen Saba’nah (17), both from Qabatya village, southeast of Jenin. During the reporting period, 47 Palestinians, including 24 children and 2 women, were wounded. In peaceful protests against Israeli policies: 28 Palestinian civilians, including 14 children, were wounded. Eighteen of them were hit with live bullets; and the 10 others were hit with rubber-coated metal bullets. In peaceful protests against Israeli incursion: 3 Palestinian civilians, including a child, were wounded. Two of them were hit with live bullets and the remaining other was hit with a rubber-coated metal bullet. At checkpoints and public roads: A child and a woman were wounded. The child was hit with a live bullet wound and the woman was hit with a rubber-coated metal bullet. In peaceful protests against the annexation wall and settlement activities: two children were wounded. The first was hit with a live bullet and the other was hit with a rubber-coated metal bullet. In Jerusalem: 12 Palestinian civilians, including 6 children and a woman, were hit with live bullets. In the Gaza Strip, Israeli forces killed 3 Palestinian civilians and wounded 59 others, including 10 children. Fifty of them were hit with live bullets and the 9 others were hit with rubber-coated metal bullets. On 18 December 2015, Israeli forces killed Mahmoud al-Agha (23), from Khan Yunis, while dozens of Palestinian youngsters were gathering near the border fence, east of Khan Yunis, and throwing stones at Israeli soldiers in protest against the Israeli violations in the West Bank. On 25 December 2015, Israeli forces killed Hani Wahdan (23), from al-Tuffah neighbourhood, when Israeli forces opened fire at Palestinian youngsters protesting near the border fence, east of al-Shuja’iya neighbourhood, east of Gaza City. On 28 December 2015, medical sources at al-Aqsa Martyrs’ Hospital in Deir al-Balah, in the central Gaza Strip, pronounced Yusef Abu Sbaikha (49), from al-Maghazai refugee camp, dead as he succumbed to injuries he sustained on 25 December 2015. It should be noted that Israeli forces opened fire at dozens of Palestinian youngsters who were protesting near the border fence, east of al-Bureij refugee camp, while Abu Sbaikha was guarding a piece of land 300 meters to the west of the border fence. North of the Gaza Strip: 4 Palestinian civilians were hit with live bullets. Gaza City: 22 Palestinian civilians, including 3 children, were wounded. 13 of them were hit with live bullets and the 9 others were hit with rubber-coated metal bullets. Central Gaza Strip: 23 Palestinian civilians were wounded with live bullets. Among the wounded were 4 children, a journalist and driver of Palestine TV. Khan Yunis: 10 Palestinian civilians, including 4 children, sustained live bullet wounds. In the context of shooting incidents at the border area, on 22 December 2015, Israeli forces stationed along the border fence between the Gaza Strip and Israel, east of Khan Yunis, south of the Gaza Strip, opened fire at a young woman that was present near the border fence, east of Khuza’a village. As a result, she sustained 2 bullet wounds to the belly and pelvis. As part of targeting Palestinian fishermen, during the reporting period, Israeli navy forces targeted Palestinian fishermen and their boats 5 times in al-Sudaniya area, west of Jabalia, and off al-Waha shore, northwest of Beit Lahia, north of the Gaza Strip. As a result, 23 fishermen, including 2 children, were arrested, but they were released later. Moreover, Israeli forces confiscated 6 fishing boats and took them to Ashdod Seaport, south of Israel. During the reporting period, Israeli forces conducted at least 185 military incursions into Palestinian communities in the West Bank and 8 ones in occupied East Jerusalem. During these incursions, Israeli forces arrested at least 130 Palestinian civilians, including 28 children and 4 women. Twenty-six of these civilians, including 13 children and a woman, were arrested in East Jerusalem. On 29 December 2015, Israeli forces raided al-Ahrar Centre for Prisoner Studies and Human Rights in Nablus. They confiscated the archive, three laptops, a PC, a TV, fax, telephone, a satellite dish and a router. After that, they fixed an order closing the centre. On the same day, Israeli forces raided a Zakat Committee office in Bethlehem after they damaged the doors. They sawed two safes and took all documents in there. It should be noted that the aforementioned committee offers services to 1,200 orphans and hundreds of families. On 17 December 2015, Israeli forces moved about 150 meters to the east of al-Qararah village, east of Khan Yunis, south of the Gaza Strip. On the next day, they moved into the same area. On 21 December 2015, Israeli forces moved about 150 meters to the east of Khuza’a village, east of Khan Yunis, south of the Gaza Strip. On 23 December 2015, Israeli forces moved into about 100 meters to the east of al-Bureij refugee camp, in the central Gaza Strip. They moved about 150 meters to the east of Gaza Valley village (Johr al-Deek) on the same day also. On 25 December 2015, Israeli forces moved about 150 meters to the east of Beit Hanoun (Erez) crossing, north of the Gaza Strip. In all these incursions, Israeli levelled land along the border areas. Moreover, Israeli forces stationed along the border fence, east of al-Salqa Valley village, was of Deir al-Balah, in the central Gaza Strip, arrested 2 Palestinian children, from the said village. The 2 children were attempting to sneak through the border fence into Israel. They were then taken to an unknown destination, but were released on 20 December 2015. In the context of seizing Palestinian houses in favor of settlement organizations, on 17 December 2015, the Israeli Magistrates Court in occupied Jerusalem handed lawsuit notices over to four families living in area (32) in Aqabet al-Khalidiyah that an Israeli settlement organization had filed lawsuits before the aforementioned court claiming that the houses in that area belong to a Jewish person. It should be noted that the families had received notices from the Magistrates Court, as 3 settlement organizations had filed cases claiming that those families’ houses belong to the these organizations. This means that judicial measures will be taken at the Israeli courts to vacate the houses in favour of the settlement organizations that claim the houses were a Jewish property in 1948. Moreover, the houses were under the Jewish Custodian of Absentee Property’s control, after which, they were transferred to the control of settlement organizations. As a result, Palestinian families were evacuated from the houses in which they lived for tens of years. On 22 December 2015, Israeli forces vacated a premises belonging to Hussein al-Qaisi in Aqabet al-Saraya neighbourhood in East Jerusalem’s Old City, claiming that it belongs to settlers. An eyewitness said to PCHR’s fieldworker that Israeli forces raided the premises and took some of its contents outdoors. They then changed the locks and arrested the premises owner. He added that the settlers claimed that it belongs to them since before 1948. In the context of house demolitions, on Tuesday, 29 December 2015, the Israeli municipality bulldozers demolished an under- construction building in Sour Baher village, southeast of occupied Jerusalem, under the pretext of non-licensing. This building belongs to Ra’ed Raja Rabay’ah. Rabay’ah said to PCHR’s fieldworker that Israeli forces demolished the under-construction building without notice. He added that he started building it two months ago. The 2-storey building has cost him NIS 170,000 so far. As part of house demolitions on grounds of collective punishment, on Tuesday, 29 December 2015, Israeli forces raided a house belonging to the family of Alaa Abu Jamal in al-Mukaber Mountain village, southeast of occupied Jerusalem. They handed an order over to his family to vacate the house in 48 hours to be demolished. It should be noted that Alaa Abu Jamal was killed by Israeli forces after he carried out a run-over and stabbing attack that resulted in the killing of an Israeli Rabbi on 13 October 2015. As part of settler attacks, on Saturday evening, 26 December 2015, a group of settlers attempted to kidnap and kill Enas Syori (23) while she was going back home in occupied Jerusalem. She was coming from Beit Hanina village and going home before she got lost around “Ramot” Street, near Shu’fat village. The aforementioned woman was surprised to see a number of masked settlers attacking her. They smashed her car windows and attempted to strangulate her. They then obliged her to step out of her car. Her husband Samer Syori said that one of the attackers attempted to strangulate Enas, but she could run away after she took off her coat that was held by one of the settlers. In the meantime, the settlers fired a number of bullets at her, but she was not hurt. On 17 December 2015, Israeli forces accompanied by an Israeli Civil Administration vehicle moved into Khellet Ibrahim and Kherbet al-Ras areas, west of Ethna, west of Hebron. The Civil Administration officer distributed notices to halt construction works under the pretext of building without construction license in area (C) according to Oslo Accords. On 22 December 2015, a group of settlers moved into al-Dhhour area, east of Beitlellow village, northwest of Ramallah, which is close to “Nahal’eil” settlement. They fired two gas canisters into a house belonging to Hussein Abed Hussein al-Najjar (32). The two canisters penetrated the kitchen window. As a result, Hussein’s wife and toddler suffered tear gas inhalation. Before withdrawing, the settler wrote in Hebrew a slogan on the walls of Hussein’s brother house nearby. At approximately 01:00, Israeli forces moved into Beit Ummar village, north of Hebron. They raided and searched 3 houses after forcing their residents to stay outside. The Israeli forces arrested 3 civilians, including a child, and later withdrew taking them to an unknown destination. The arrested persons were identified as Rami Khalil Mahmoud Abu Dayyah (21); Mo’az Wael Ikhlayel (19) and Karam Yousif Hasan Ikhlayel (16). At approximately 10:00, Israeli forces moved 150 meters into the east of al-Qararah village to the east of Khan Younis in the southern Gaza Strip. They levelled lands for hours and then redeployed along the border fence. At approximately 10:30, Israeli forces moved into Bitounia village, west of Ramallah. They raided and searched an old abandoned house near the municipality. They arrested 4 children, who were in the abandoned house, and took them to Ofer detention facility, south of the village. The arrested chlidren were identified as Fahim Ahmed al-Khatib (16); ‘Ali Shaladah (17); Qays ‘Afanah (16) and ‘Omer Mazen Jaradat (16). In a new excessive use of force, Israeli forces killed a Palestinian child, south of Howarah checkpoint at the southern entrance to Nablus. According to PCHR’s investigations, at approximately 10:40 after stepping out from a military jeep coming from Howarah checkpoint, south of Nablus, Israeli forces shot dead ‘Abdullah Hussein Ahmed Nasasrah (15) from Beit Foriq, east of the city. Israeli forces claimed that the child attempted to carry out a stab attack. However, PCHR’s investigations refuted the claims as the child crossed the checkpoint in front of the Israeli soldiers stationed there, and he did not have any sharp tool with him. He was searched by the Israeli soldiers before being killed. At approximately 11:00, Israeli forces moved into Shweikah Suburb, north of Tulkarm. They patrolled the streets of the Suburb and then arrested Khaled Jamal ‘Abdulatif Foqaha (26) after beating him. They then took Foqaha to an unknown destination. At approximately 15:30, Israeli forces opened fire from a military jeep at ‘Abdel Rahman Eyad Jabbour (15) from Salem village, east of Nablus. As a result, he was wounded with a bullet to the right foot and then taken by a civilian car to Nablus. Israeli soldiers stopped the car for a while, and a Palestinian ambulance then arrived at the scene. The wounded person was evacuated by the ambulance to Rafidia Governmental Hospital. At approximately 16:10, Israeli forces moved into al-Laban al-Sharqi village via its main entrance branching from Ramallah-Nablus Street, south of Nablus. A number of Palestinian children gathered to throw stones and empty bottles at the Israeli soldiers, who in response fired live and rubber-coated metal bullets at them and chased them into the village. As a result, a 14-year-old child was hit with a rubber-coated metal bullet to the leg and taken to Yasser ‘Arafat Governmental hospital in Salfit to receive medical treatment. At approximately 17:00, Israeli forces stationed along the border fence between the Gaza Strip and Israel, east of al-Salqa Valley village, east of Deir al-Balah in the central Gaza Strip arrested Mohammed Mousa Salem Abu Zayed (16) and Mohammed ‘Abed ‘Abdullah Abu Nseir (16), both from al-Salqa Valley village, after attempting to sneak via the border fence. They were taken to an unknown destination but released in Sunday, 20 December 2015. In the afternoon, Israeli forces arrested Ahmed ‘Abdullah Mohammed Abu Sallam “Hweiti” (45) from Tulkarm refugee camp when he was in the Israeli Military Liaison “D. C. O.”, southwest of Tulkarm. The aforementioned civilian was previously summoned by phone to refer to the Israeli Intelligence. At approximately 20:00, Israeli forces moved into Sanour village, south of Jenin. They raided and searched a house belonging to Mo’ataz Mohammed Weld ‘Ali (22) and forced its residents to stay outside. The Israeli soldiers then raided and searched a house belonging to Fathi Rasmi Jarrar (28) after expelling and questioning the residents. Israeli forces later withdrew from the village, but neither further incidents nor arrests were reported. Note: During the aforementioned day, Israeli forces carried out 11 incursions in the following areas without reporting any arrests: al-Nazlah al-Gharbiyah village, north of Tulkarm; Yata; al-‘Aroub refugee camp; villages of al-Samou’a, Beit Kahel, Ethna, Sa’ir, Abu al-‘Asja and al-Majd in Hebron; Dura al-Qare’a village, northeast of Ramallah; and ‘Ein Ayyoub area, west of Ras Karkar village, northwest of the city. At approximately 01:00, Israeli forces moved into Jabe’a village, south of Jenin. They raided and searched a house belonging to Faris ‘Abdel Fattah Mohammed Fashafshah (25) and arrested him as well. At approximately 01:30, Israeli forces moved into Bani Na’im village, east of Hebron. They raided and searched a house belonging to Hamzah ‘Issa Barakat (31). They arrested the aforementioned civilian and later withdrew taking him to an unknown destination. At approximately 02:00, Israeli forces moved into Yata, south of Hebron. They stationed in Zeif area and then raided and searched two houses. They arrested ‘Issa Talan Abu Fanous (29) and ‘Alaa’ Isma’il ‘Awad (26) and later withdrew taking them to an unknown destination. At approximately 02:30, Israeli forces moved into Tulkarm and stationed in al-Salah neighbourhood, east of the city. They raided and searched a house belonging to ‘Omer Ibrahim Mohammed Abu Daji “Badawi” (19) and arrested him. The Israeli soldiers then re-stationed near al-Farid Cinema in the western neighbourhood in the city and raided and searched a house belonging to Mohammed Jamal Yousif Sa’adah (22). They arrested him as well and alter withdrew. At approximately 02:50, Israeli forces moved into Nablus. They raided and searched a number of houses. They arrested Ahmed Samir Nayef Shana’ah (28) and later withdrew taking him to an unknown destination. At approximately 03:00, Israeli forces moved into Bethlehem. They stationed in al-Saf Street in the centre of the city and then raided and searched a number of houses in the area. They arrested Hamzah Ibrahim Hamdan Jabrin (19) and ‘Awad Mahmoud ‘Asakrah (22) and took them to an unknown destination. At approximately 04:00, Israeli forces moved into ‘Anabta village, east of Tulkarm. They raided and searched a house belonging to ‘Abdullah Jamil ‘Abdel Khaleq Fahel (31). They arrested him and confiscated a laptop and 3 other cell phones. At approximately 07:20, Israeli forces moved 150 meters into the east of al-Qararah village to the east of Khan Younis in the southern Gaza Strip. Amidst Israeli shooting, they levelled for hours lands adjacent to the border fence and then redeployed along the fence. In a new excessive use of force, Israeli forces killed a Palestinian civilian from Sanjel village, north of Ramallah. According to PCHR’s investigations, at approximately 11:00, an Israeli infantry forceof 4 soldiers moved into al-Jabal area, east of Sanjel village, north of Ramallah. Dozens of Palestinian youngsters gathered to throw stones at the Israeli soldiers, who in response fired live bullets at them. In the afternoon, the Israeli soldiers chased the demonstrators into the village while another infantry force of 4 Israeli soldiers arrived and chased the youngsters into the alleys of the village amidst Israeli shooting at them. A number of soldiers topped the roofs of houses and shops in the village and randomly opened fire at them in the area. At approximately 15:45, a 26-year-old civilian was hit with a bullet to the right leg and transferred to Palestine Medical Governmental Complex in Ramallah for medical treatment. At approximately 16:45 when the youngsters were in al-Moghraq area in the Old city, the Israeli soldiers were on their way out of the village and shooting at the demonstrators. The distance between the youngsters and soldiers was only 150 meters. Due to the shooting, Nasha’t Jamal ‘Abdel Razeq ‘Asfour (34), who was not participating in the demonstration, was hit with a live bullet that penetrated his abdomen and exited from his back. The wounded young man was taken by a PRCS ambulance to Palestine Medical Complex, where doctors succeeded to revive his heart. The aforementioned young man was admitted into the Operation Room (OR) and underwent a 4-hour surgery. At approximately 20:43, medical sources declared his death due to his critical wounds. At approximately 20:30, Israeli forces moved into Ya’bud village, southwest of Jenin. They stationed in al-Maloul neighbourhood, south of the village, and then raided and searched a house belonging to the family of Yehia Khaled Tawfiq Abu Shammalah (41). They topped the roof and turned it into a military barrack after detaining the residents and preventing them from leaving. Israeli forces later withdrew, and neither further incidents nor arrests were reported. Note: During the aforementioned day, Israeli forces carried out 15 incursions in the following areas without reporting any arrests: Dura; al-Fawar refugee camp; villages of Beit Oula, al-Fahs, Dweirban, Ras al-Jorah, Beit ‘Awa, Kharsa, Hadab al-‘Alqah, Jaljelia, al-Laban al-Gharabi, Kherbet Abu Falah and Deir Jarir in Ramallah and al-Bireh; Marj Na’ajah village, north of Jericho. At approximately 01:00, Israeli forces moved into Beit Ummar, north of Hebron. They raided and searched two houses and handed two of the houses’ residents summonses to refer to the Israeli Intelligence in “Gosh ‘Etzion” settlement, south of Bethlehem. The two summoned persons were identified as Yousif Bader Mahmoud Ikhlayel (35) and Mohammed Fakhri Mousa Ikhlayel (20). At approximately 03:00, Israeli forces moved into Jenin. They raided and searched a house belonging to Mohammed Tawfiq Mahmoud Nazzal (26) in al-Marah neighbourhood, southeast of the city, and arrested him. At approximately 03:30, Israeli forces moved into the southern area in Hebron. They stationed in Qaytoun area and then raided and searched a house belonging to Joudi ‘Abdel Rahim Abu Hadid (30). Israeli forces later withdrew, and no arrests were reported. At approximately 11:00, Israeli forces moved into Jenin for the second time within few hours. They raided and searched a house belonging to Ra’ouf Sho’a’a Ra’ouf Zugheibi (25) on al-‘Askari Street, northwest of the city, and arrested him. Note: During the aforementioned day, Israeli forces carried out 5 incursions in the following areas without reporting any arrests: Yata, Halhoul, al-‘Aroub refugee camp, Ethna village, Deir al-‘Asal village in Hebron. At approximately 01:00, Israeli forces moved into Dura, southwest of Hebron. They stationed in Kenar area and then raided and searched a house belonging to Ra’ed Hasan ‘Amr (28). They arrested the aforementioned civilian and later withdrew taking him to an unknown destination. At approximately 01:30, Israeli forces moved into Ya’bud village, southwest of Jenin. They stationed in al-Maloul neighbourhood, south of the village and then raided and searched a house belonging to the family of Yehia Khaled Tawfiq Abu Shamlah (41). They topped his roof and turned it into a military barrack after detaining the residents and preventing them from leaving. Israeli forces later withdrew and neither further incidents nor arrests were reported. Israeli raided the house for the second time in 48 hours. Moreover, Israeli forces again moved into the aforementioned village at approximately 13:00 and at approximately 20:00. At approximately 02:00, Israeli forces moved into a number of neighbourhoods in Hebron. They raided and searched two houses an arrested two civilians. They were identified as Mo’atax Thib al-‘Awei’ie (34) and Maher ‘Ali al-Qawasmah (27). At approximately 08:30, Israeli forces closed all the sub-roads to the villages in the eastern side of Yata with sand barriers using bulldozers. Many military vehicles moved into 8 areas within al-Mosafer area, southeast of the city. They raided tents and caves, where the residents of the area live. The soldiers raided the schools of al-Majaz and al-Fakhit and handed Ibrahim Mousa Abu ‘Aram a summons to refer to the Israeli Intelligence in “Gosh ‘Etzion” settlement in Bethlehem. The Israeli vehicles later withdrew from the area, and a number of them stationed near the sand barriers, where the soldiers detained the teachers of Shahd al-Batam School and confiscated a car belonging to teacher Jihad Irshid in addition to fining him with NIS1000. At approximately 10:30, Israeli forces moved into Bitounia village, west of Ramallah. They patrolled the streets and then arrested Akram Ya’qoub Abu Dayyah (14), who was walking near the municipality building on his way back from school. He was then taken to ‘Ofer detention centre, south of the village. In the morning, ‘Ablah ‘Abdel Wahad Hasan al-‘Adam (45) from Beit Oula village, west of Hebron, was hit with a rubber-coated metal bullet to the upper side of the head. The aforementioned woman was wounded when she was in front of a checkpoint established at the northern entrance of al-Shuhadaa’ Street. She was arrested by Israeli forces and taken to an unknown destination. According to PCHR’s investigations at approximately 11:00, two civilians were near Checkpoint 56 entering some bags noting that the Israeli authorities had closed the checkpoint for few days under the pretext of maintenance and repairs. Meanwhile, one of the Israeli soldiers was standing in the middle of a pedestrian track to search the bags they had. ‘Ablah attacked the soldier with a knife, but he did not get hurt. Meanwhile, another soldier fired a rubber-coated metal bullet to the upper right side of her head, so she fell near a closed shop. PRCS ambulances immediately arrived and approached the woman to offer her medical treatment. In the meantime, the soldiers deployed in front of the checkpoint and took the woman. Her family was then informed that she is under arrest. At approximately 20:00, Israeli gunboats stationed off al-Sudaniyah shore, west of Jabalia in the northern Gaza Strip, sporadically opened fire in the vicinity of Palestinian fishing boats sailing within 4 nautical miles and chased them. The shooting which continued for 10 minutes caused fear among fishermen who were forced to flee to the shore. However, neither casualties nor damages were reported. Note: During the aforementioned day, Israeli forces carried out 10 incursions in the following areas without reporting any arrests: Senjel village, north of Ramallah; Hablah village, east of Qalqilya; villages of Sorif, al-Samou’a, al-Simia, Beit Marsam, Hafayer Basem and Beit ‘Awa in Hebron. At approximately 01:00, Israeli forces moved into Beit ‘Awwa village, southwest of Dura, southwest of Hebron. They raided and searched 3 houses, from which 3 children were arrested. Israeli forces later withdrew taking them to an unknown destination. The arrested children were identified as Akram Samir Maslamah (17); Karam Taha Masalamah (17) and Sa’ed Ibrahim Masalamah (17). At approximately 02:00, Israeli forces moved into Selwad village, northeast of Ramallah. They raided and searched a house belonging to Ghaleb Sami Ahmed Wardah (30). They arrested the aforementioned civilian and later withdrew taking him to an unknown destination. It should be mentioned that Wardah was wounded with a live bullet in his right leg a month ago and cannot walk. The Israeli forces then raided a house belonging to Mohammed ‘Abdel Rahman Ahmed ‘Ayyad (21), who was killed on 18 December 2015 at the entrance to the aforementioned village. The force officer questioned on the spot the father to know some information about him and the homeownership. Explosive engineering experts surveyed and took measures of the house from the inside. At approximately 04:30, Israeli forces withdrew from the house, but no arrests were reported. Around the same time, Israeli forces moved into Jeet village, northeast of Qalqilya. They raided and searched a house belonging to Durgham Mohammed Yamin (20), a student at al-Khadduri University. Israeli forces arrested the aforementioned civilian and confiscated 3 laptops from the house. They later withdrew taking him to an unknown destination. At approximately 02:30, Israeli forces moved into Tulkarm. They raided and searched a house belonging to the family of Hadi ‘Emad Mohammed al-Sader (23) and arrested him. They damaged the house contents and confiscated 3 cell phones. Israeli forces re-stationed in the eastern neighbourhood of the city and then raided and searched a house belonging to Dr. ‘Abdel Rahim Bassam ‘Ali Abu Shanab (27). They arrested him as well. Abu Shanam is the second doctor being arrested from Tulkarm in a week. Around the same time, Israeli forces moved into Halhoul, north of Tulkarm. They stationed in al-Nabi Younis and then raided and searched a house belonging to ‘Issa ‘Abdel Halim Zama’arah (45). They arrested his two sons ‘Abdel Halim (16) and Bahaa’ (15) and later withdrew taking them to an unknown destination. At approximately 07:00, Israeli forces moved 150 meters into the east of Khuza’ah village to the east of Khan Younis in the southern Gaza Strip. They levelled lands opposite to Abu Reidah neighbourhood in the village and then redeployed along the border fence after hours of levelling. Around the same time, large Israeli force backed by undercover units in a vehicle selling chicken moved into al-Dheisheh refugee camp, south of Bethlehem. They raided and searched a house belonging to former prisoner Saleh Mohammed al-Ji’eidi (26) and arrested him. They then blow up the house doors. Meanwhile, dozens of young men from the camp threw stones at the Israeli soldiers, who fired tear gas canisters in the area. As a result, dozens of civilians suffered gas inhalation, including an infant identified as Ahmed Ashraf al-J’eidi, Saleh’s nephew, who was transferred to hospital for medical treatment. Jacqueline Fararjah, Saleh’s lawyer, said to a PCHR’s fieldwork that Saleh who is detained in Kfar ‘Etzion detention facility told her during her visit to him, “A special Israeli force blew up the house entrance and then arrested him. They then hit his head to the wall more than once and threw him on the ground. The soldiers then started kicking and hitting him with the riffles’ butts. He was then taken to ‘Etzion detention facility and kept him from 08:00 till the afternoon outside. Fararjah emphasized that bruises were clear on Saleh’s body due to the beating. At approximately 10:05, Israeli gunboats stationed off al-Wahah shore, northwest of Beit Lahia in the northern Gaza Strip, heavily opened fire in the vicinity of the Palestinian fishing boats sailing within 3 nautical miles. The gunboats also fired shells and chased them. The shooting, which continued for 15 minutes, caused fear among fishermen who fled to the shore. Neither causalities nor damages were reported. At approximately 18:00, Israeli gunboats stationed off al-Wahah shore, northwest of Beit Lahia in the northern Gaza Strip, heavily opened fire in addition to firing dozens of shells in the vicinity of Palestinian fishing boats sailing between 1.5 to 2.5 nautical miles. The gunboats surrounded a number of boats and arrested 4 fishermen. They took them to an unknown destination and confiscated two boats. The Israeli naval forces also damaged dozens of fishing nets. The arrested fishermen were released on Tuesday, 22 December 2015, and identified as Wisam Fathi Mohammed al-Sultan (33); Amjad Jom’ah Ahmed Zayed (38), both from al-Salatin neighbourhood in Beit Lahia; Khader Jamal Isma’il Baker (22) and Ayman Jamal ‘Awadalah (19), both from al-Ramal neighbourhood in Gaza City. Note: During the aforementioned day, Israeli forces carried out 8 incursions in the following areas without reporting any arrests: Hejah village, east of Qalqilya; al-Fawar refugee camp; villages of Na’im, Sorif, Beit Ummar, al-Mawreq, al-Beid and al-Salam neighbourhood in Hebron. At approximately 01:30, Israeli forces moved into Halhoul, north of Hebron. They stationed in al-Camp area and then raided and searched a house belonging to ‘Emad ‘Ali al-Sa’dah (44). They arrested his two sons ‘Emad (15) and Mohammed (14) and later withdrew taking him to an unknown destination. At approximately 02:00, Israeli forces moved into Dura, southwest of Hebron. They stationed in al-Namus area and then raided and searched a house belonging to the family of Kamel Ahmed Nassar. They arrested his son Thaer (20) and took him to an unknown destination. Around the same time, Israeli forces moved into Sayda village, north of Tulkarm. They raided and searched a house belonging to the family of Seddiq Mahmoud Hasan ‘Odah (29). They arrested the aforementioned civilian and later took him to an unknown destination. At approximately 03:00, Israeli forces moved into Madma village, southeast of Nablus. They raided and searched a number of houses, from which Ahmed ‘Amer Nassar (22) was arrested. Israeli forces later withdrew taking him to an unknown destination. Around the same time, Israeli undercover units dressed in Palestinian civilian clothes sneaked into Tubas using a white Mercedes bus and a mini truck with a Palestinian registration plate. They raided and searched a house belonging to Aysar Mustafa Maslamani (22) in al-Naqqar neighbourhood near al-Quds Open University at the southern entrance of the city. They arrested the aforementioned civilian and took him to an unknown destination. Around the same time, Israeli forces raided and searched a house belonging to Hisham Khaled al-Atrash (27) in al-Waljah village, northwest of Bethlehem. They arrested the aforementioned civilian and took him to an unknown destination. At approximately 03:30, Israeli forces moved into Tulkarm and Tulkarm refugee camp adjacent to the city. They raided and searched a house belonging to Soliman Ahmed Soliman Ibrahim (23), an officer in the Palestinian National Security Service, and arrested him. They then raided and searched a house belonging to the family of ‘Amer ‘Abdullah Ahmed Sarhan (19) and arrested him as well. Around the same time, Israeli forces moved into Zita village, north of Tulkarm. They raided and searched a house belonging to Ahmed Mofid Ahmed Zaghloul (34), an employee in al-Quds Ban-‘Atil branch, and arrested him as well. At approximately 12:00, Israeli forces stationed along the border fence between the Gaza Strip and Israel, east of Khan Younis in the southern Gaza Strip, opened fire at a young woman, who was near the aforementioned fence, east of Khuza’ah village. As a result, she was wounded and fell on the ground. She started calling for help as she was bleeding. Civilians and paramedics tried to reach her, but the Israeli soldiers opened fire at them and denied them access. After coordinating with the Red Cross, the Israeli soldiers allowed one of the paramedics to carry her without a litter to the PRCS ambulance, which was dozens meters away. She was then taken to Gaza European Hospital. The young woman was identified as Maisaa’ Wajih Mohammed al-Namnam (28) from al-Shaymaa’ in Beit Lahia in the northern Gaza Strip, and was hit with a bullet in the abdomen and pelvis. The delay in offering aid to her caused severe bleeding as she underwent an urgent operation and was admitted into the intensive care unit. Note: During the aforementioned day, Israeli forces carried out 11 incursions in the following areas without reporting any arrests: Yata; villages of al-Samou’a, Beit Oula, Karisah, al-Sorah, Hadab al-‘Alqah, Amrish, ‘Anabta and ‘Ezbet al-Jarad in Tulkarm; Shofah village, southeast of the city, and Shwikah Suburb, north of the city. At approximately 01:00, Israeli forces moved into Biret al-Khelah in the centre of Beit Loqaya village, southwest of Ramallah and al-Bireh. They raided and searched a house rented by the family of Isma’il Mousa Mohammed al-Hadidi (37) and damaged its furniture. The aforementioned was arrested by the Israeli police from his workplace in “Modi’in” settlement, west of the village, the day before claiming that he attacked his manager and another worker with a hammer. The Israeli police declared then that suspicions pointed out that the incident happened on national grounds. Explosive engineering experts surveyed the house and took its measures from the inside and later withdrew. It should be mentioned that the house is owned by ‘Issa ‘Asfour. Around the same time, Israeli forces moved into neighbourhoods in Hebron. They raided and searched two houses in Abu Katilah area. They arrested ‘Alaa’ Bassam Mohammed al-Karaki (23) and Wisam Sa’id al-Haymouni (20) and later withdrew from the houses taking them to where the military vehicles were stationed. Meanwhile, another Israeli force raided and searched a house belonging to Shadi Na’im al-Khatib (25) in Abu Roman area searching for him, but he was not at home. The force officer ordered al-Khatib’s family that he should turn himself in to the nearest Israeli observation point. Around the same time, Israeli forces moved into Jenin. They stationed in al-Basatin neighbourhood, north of the city. They raided and searched a house belonging to Hamas leader Wasfi ‘Ezzat Hasan Qabha (55), who was a former Palestinian Minister of Prisoners. They violently held his family in one room as they pushed them into the guest room. The Israeli soldiers removed all martyrs’ photos from the house walls. An Israeli officer then arrived at the house and asked Qabha to talk with him alone. After half-an-hour talking, during which, he threatened Qobaha of attempting to carry out any hostile activity, the Israeli forces withdrew from the city, but no further incidents were reported. At approximately 01:30, Israeli forces moved into Ya’bud village, southwest of Jenin. They deployed all over the village while some of them carried out a raid and search campaign against many houses. Those houses belong to Hadi Tawfiq Jaber Hamarshah (33); Mahdi ‘Abdel Rahim Yasin Abu Baker (42); Mohammed ‘Abdel Rahim Au Baker (35); Samir ‘Abdel Naser Abu Baker (40); Mohammed Sharif Faris Abu Baker (59); ‘Abdullah ‘Abed Ghanayem ‘Amarnah (54); Mahmoud Nayef ‘Atiyah Turkman (47); Mahmoud Khalil Herzallah (39); Sami Tawfiq Soliman ‘Amarnah (57) and Bassam Ahmed Mohammed Ghannam (52). They damaged all the house contents and questioned all residents. The Israeli soldiers then raided and searched a house belonging to Ya’bod Mayor Dr. Samer ‘Abdullah Salim Abu Baker (40). They handed him a military order to close Street 585 between Ya’bud and Imreihiyah villages, southwest of Jenin, and threatened of discharging him from his position as a mayor in case Palestinians continued to throw stones on the bypass road near “Mevo Dotan” settlement. The Israeli soldiers then raided and searched a house belonging to former prisoner ‘Ezz al-Deen Majd Ahmed Mahmoud ‘Amarnah (44), who is blind, and arrested him. At approximately 02:30, an Israeli infantry force of 10 soldiers moved into Ras al-‘Aqabah neighbourhood in al-Moghir village, northeast of Ramallah and al-Bireh. They raided and searched a 2-storey house belonging to Ahmed Mahmoud Jaber Abu ‘Alia. The first floor is a residential apartment and the second one is still under construction. The soldier topped the house roof and turned it into a military barrack raising the Israeli flag. At approximately 12:00, Israeli forces withdrew, but no arrests were reported. At approximately 09:00, Israeli gunboats arrested nine Palestinian fishermen who were on two fishing boats sailing within 3 nautical miles off al-Soudaniyah shore, north of Gaza City. The gunboats chased the fishing boats and directly fired at their engines to stop them. The Israeli naval officers then surrounded the two boats and ascended them. They beat the fishermen and used electroshock weapons. They took them to Ashdod Seaport and confiscated the boats. At approximately 02:00 on Thursday, 24 December 2015, Israeli forces released them via Beit Hanoun crossing. It should be mentioned that the first boat belongs to Shafiq Ragheb Faris Baker, who was not on it, and was manned by Ra’ed ‘Abdel Fattah Baker (40); Taysir Yehia Baker (25); Medhat Fahmi Baker (40) and Mahmoud Abu Ghanem (35). The second boat belongs to Nizar Mustafa Mohammed Baker (48), who was on the boat with his son Mohammed (17), Ramadan Subhi Faris Baker (40), Mohammed Jamal Mustafa Baker (33), ‘Omer Mohammed Subhi Baker (35) and ‘Aziz Redwan Baker (27). At approximately 10:00, Israeli border guard officers stationed at checkpoint 160 between the southern area of Hebron and al-Ibrahimi Mosque fired tear gas canisters at school students, who were on their way out from the schools near the checkpoint under the pretext of being thrown with stones. As a result, many students suffered tear gas inhalation. At approximately 15:00, an Israeli infantry force of 4 soldiers moved into al-Jabal area in al-Nabi Saleh village, northwest of Ramallah. They tried to raid a house belonging to activist Nariman Tamimi, but she prevented them. Meanwhile, dozens of Palestinian children and young men gathered to throw stones at the Israeli soldiers, who in response fired sound bombs and tear gas canisters in addition to rubber-coated metal bullets to disperse them. The force later withdrew, but neither further incidents nor arrests were reported. At approximately 14:00, Israeli forces moved 150 meters into the east of Gaza Valley village in the central Gaza Strip. Amidst drone’s hovering, they levelled lands adjacent to the border fence between the Gaza Strip and Israel and then headed to the north. At approximately 17:00, the vehicles redeployed along the border. At approximately 23:30, Israeli forces moved into al-‘Arqah villagem west of Jenin. They raided and searched a house belonging to the family of Mahmoud Nahedh ‘Abdel Ghanui Yehia (19) and arrested him as well. Note: During the aforementioned day, Israeli forces carried out 7 incursions in the following areas without reporting any arrests: Halhoul, al-‘Aroub and al-Fawar refugee camps and villages of Beit Kahel, Beit Oula and al-Koum in Hebron and Tulkarm. At approximately 01:00, Israeli forces moved into Tulkarm. They raided and searched a house belonging to Mo’in ‘Awwad ‘Abdel Rahim ‘Odah (22) and arrested him. At approximately 01:30, Israeli forces moved into al-Salam neighbourhood in Hebron. They raided and searched two houses, from which they arrested Ashraf Mohammed Nabil al-Rajabi (27) and Hamed Khaled Hasan al-Qawasmah (30). Israeli forces later withdrew taking them to an unknown destination. At approximately 02:00, Israeli forces moved into al-Mo’asakr al-Jadeed refugee camp, northeast of Nablus. They patrolled the streets when a number of Palestinian children and young men gathered to throw stones and empty bottles at the Israeli vehicles. The Israeli forces in response opened fire at them wounding a 19-year-old civilian with a bullet to the thigh. A number of soldiers raided and searched a house belonging to Mohammed Zaki Abdah (22). They arrested the aforementioned civilian and later withdrew taking him to an unknown destination. At approximately 02:30, Israeli forces moved into al-Fawar refugee camp, south of Hebron. They raided and searched 3 houses, from which 4 civilians, including a child, were arrested and taken to an unknown destination. The arrested civilians were identified as Mahmoud Majed al-titi (17), his brother Ibrahim (23); Fahmi ‘Abed Raboh Ghatashah (28) and Ya’qub Mahmoud Abu Hashash (30). At approximately 03:00, Israeli forces moved into Beit Foriq village, east of Nablus. They raided and searched a number of houses, from which Sadeq Sedqi Khatabah (20) was arrested. Israeli forces later withdrew taking him to an unknown destination. Around the same time, Israeli forces moved into Tubas and then stationed in al-Naqqar neighbourhood at the southern entrance of the village. They raided and searched a house belonging to the family of Jihad Mustafa Masalamani (20). They arrested the aforementioned civilian and later withdrew taking him to an unknown destination. At approximately 03:30, Israeli forces moved into Yata village, south of Hebron. They raided and searched two houses, from which Mosleh Mohammed Abu ‘Aram (52), a Judge in the First Instance Court in Hebron, and Ra’ed Ahmed I’aqeilan (30) were arrested. Israeli forces later withdrew taking them to an unknown destination. Around the same time, Israeli forces moved into Bita village, southeast of Nablus. They raided and searched a number of houses, from which 4 civilians were arrested and taken to an unknown destination. The arrested civilians were identified as Qassam ‘Enad Ibrahim Jaghoub (22); Ahmed ‘Abdel Rahman Mustafa (23); Mo’ataz Hussein Helal Tayeh (20) and Aysar Nedal Fahmi Jaghoub (21). At approximately 08:30, Palestinian medical sources declared the death of Mohammed Zahran ‘Abdel Halim Zahran (22) from Kafr al-Deek village, west of Salfit, after being shot by Israeli soldiers. Israeli forces claimed that Zahran carried out a stab attack at the entrance to the industrial area of “Ariel” settlement, north of the city, so the Israeli soldiers shot him dead. At approximately 09:00, Israeli gunboats arrested ten Palestinian fishermen on two boats sailing within 3 nautical miles off al-Soudaniyah shore, north of Gaza City. The gunboats chased the boats and directly opened fire at the engines to stop them. The naval soldiers surrounded the two boats and ascended to them. They then surrounded the two boats and ascended them. They beat the fishermen and used electroshock weapons. They took them to Ashdod Seaport and confiscated the boats. At approximately 22:00 on the same day, Israeli forces released them via Beit Hanoun Crossing after questioning each one of them. The investigation included asking for their personal data and confirming information about their relatives and neighbors. It should be mentioned that the first boat belongs to ‘Etaf ‘Aed Baker (33), who was on the boat with his two brothers Muhib (30) and Mohammed (16) in addition to Mohammed zuheir al-Ashwah (26) and Yosri Nafez ‘Ali al-Akhsham (22). The second boat was manned by its owner Bahjat Khalil Baker (47), his son Khalil (23), Hasan Zaki Baker (34), Mohammed Jamal Baker (27) and Shadi Jad Baker (12). At approximately 10:30, Israeli forces stationed at a checkpoint established at the south-eastern entrance of Hebron (al-Fahs) killed Eyad Jamal ‘Issa D’eisat (25) from Beit ‘Amrah village, west of Yata, south of Hebron, under the pretext of having a screw and trying to carry out a stab attack. Eyad’s family said that their son was on his way to al-Fahs area to buy construction blocks. The Israeli soldiers opened fire at him when he brought a screw to repair his vehicle, which broke down near the area where he was killed. Eyewitnesses emphasized that the young man only crossed 5 meters into the checkpoint coming from al-Fahs area attempting to reach Bypass road (60) when the Israeli soldiers stationed at the checkpoint opened fire at him after screaming at him not to attack any of the soldiers. At approximately 11:15, Israeli forces moved into Kafr al-Deek village, west of Salfit. They raided and searched a house belonging to Mohammed Zahran ‘Abdel Halim Zahran and questioned his family. Israeli forces withdrew at approximately 14:00. It should be mentioned that the aforementioned civilian was killed on the same day morning at the entrance to the Ariel industrial area, north of Salfit. Note: During the aforementioned day, Israeli forces carried out 5 incursions in the following areas without reporting any arrests: villages of Beit ‘Awa, al-Thaheriyah, Bani Na’im, al-Mowareq and Abu al-‘Asja in Hebron. At approximately 01:00, Israeli forces moved into Kafr al-Deek village, west of Salfit. They raided and searched a number of houses from which Fadi (36) and Majdi Rateb Mustafa al-Deek (32) was arrested. Israeli forces later withdrew taking them to an unknown destination. At approximately 01:30, Israeli forces moved into Nablus. They raided and searched a number of houses. They arrested ‘Obadah Ahmed al-Shbeiri (28) from his family house in Qaryoun neighbourhood in the Old City and later withdrew taking him to an unknown destination. At approximately 03:30, Israeli forces moved into Yata, south of Hebron. They stationed raided and searched a house belonging to Jebril Khalil Shahin (55). They arrested the aforementioned civilian and his son Nemer (25) and later withdrew taking them to an unknown destination. At approximately 14:50, Israeli forces moved 150 meters into the agricultural lands, east of Beit Hanoun crossing in the northern Gaza Strip. The Israeli vehicles levelled lands in the area and at approximately 15:30 redeployed along the border fence between the Gaza Strip and Israel. At approximately 16:30, Israeli soldiers opened fire a Hyundai car with a Palestinian registration plate while passing by al-Wasatiyah neighbourhood near the western entrance to Selwad village, northeast of Ramallah. As a result, the driver Mahdiyah Mohammed Ibrahim Hammad (40) from the village was killed. According to PCHR’s investigations and eyewitnesses, at approximately 15:40, Israeli forces backed by military vehicles and a bulldozer moved into the western entrance to Selwad village. The bulldozer immediately closed the entrance with sand barriers and cement cubes. The soldiers deployed in the vicinity of the entrance, and an Israeli infantry force, border guard agents and another force dressed in black military uniforms deployed between the houses amidst Israeli shooting and firing of tear gas canisters at al-Horiyah building. At approximately 16:30, a Palestinian grey Hyundai car very slowly moved from al-Nejarah neighbourhood to al-Wasatiyah neighbourhood near the aforementioned entrance. When the car arrived 20 meters away from the soldiers, they pointed their weapons at the car. The aforementioned woman spontaneously raised her hands up out of fear. The car kept moving but slowly, and the Israeli soldiers then heavily fired at it from all sides. Therefore, the car veered and hit a cement wall. Three soldiers approached the car and again opened fire at it from a distance of 5 meters. The soldiers approached it more when an ambulance arrived at the scene. However, the soldiers prevented the ambulance rom approaching by firing bullets in the air while the woman was left to bleed without giving her first aid until she drew her last breath. Around 20 minutes later, they took the woman out of the car and put her on a litter. They took her to a military car parked near the watchtower established near the aforementioned entrance. Her corpse was then taken to an unknown destination. At approximately 19:00, the corpse was handed to the Israeli Military Liaison in Beit Eil settlement established on Palestinian lands of Bitin village, northeast of Ramallah. She was transferred by an ambulance to Selwasd village to Palestine Medical Governmental Complex in the city. The Palestinian Ministry of Health said that Hammad was hit with several bullets to the face, chest and pelvis. According to the fist examination, ten bullets, which penetrated her body, killed her. Note: During the aforementioned day, Israeli forces carried out 7 incursions in the following areas without reporting any arrests: Halhoul; villages of Bani Na’im, Tarama, Sekah, al-Majd, Tarousah and Askaka, east of Salfit. At approximately 01:00, Israeli forces moved into Beit Fajjar village, south of Bethlehem. They handed two summonses to Samer Yousif thawabtah (28) and ‘Ali Kamel Taqaqah (23) to refer to the Israeli Intelligence in “Gosh ‘Etzion” complex, south of the city. At approximately 01:30, Israeli forces moved into Beit Ummar village, north of Hebron. They stationed in al-Tarbiqah area and then raided and searched a house belonging to ‘Ali ‘Ayyad ‘Awad (51). When the soldiers were on their way out of the house, they handed the aforementioned civilian a summons to refer to the Israeli Intelligence in Tarqoumia crossing, west of Hebron. In a new excessive use of force, Israeli forces stationed at Howarah checkpoint, south of Nablus, killed a Palestinian civilian, who was in his car normally crossing the checkpoint. According to PCHR’s investigations, at approximately 15:15, Maher Zaki Hussein al-Jabi (45) was driving his grey Peugeot-305 car out of Nablus via Howarah crossing, south of the city. The car was slowly moving as the soldiers were searching other cars. When his turn came, he approached the checkpoint and two soldiers came from the left side of the checkpoint. One of them stepped towards him and the other was right behind the soldier. The later slipped on the pavement and fell on his back. Another soldier, who was 10 meters away from him, rushed towards him and fired 4 bullets at the car, which was still slowly moving. As a result, the driver was directly hit to the face and lost control over the car, which then hit a cement cube. The soldiers then brought an Israeli ambulance to evacuate the soldier to an Israeli hospital while a PRCS ambulance arrived to take the Palestinian wounded person to Rafidia Surgical Hospital in Nablus. Following medical examination, it was found out that he was hit with an explosive bullet, which penetrated the left cheek and exited the right cheek causing laceration in the face and another bullet in the left hand causing another laceration. The wounded person was admitted into the ICU in the hospital and half an hour later drew his last breath. At approximately 01:00, Israeli forces moved into Tulkarm and stationed in al-Salam neighbourhood, east of the city. They raided and searched a house belonging to Mohammed ‘Abdel Rahman Ahmed al-Fakhouri (26) and arrested him as well. Around the same time, Israeli forces moved into Beit Ummar, north of Hebron. They stationed in al-Thaher area and then raided and searched a house belonging to Ibrahim Hamdi Abu Mariah (29). The Israeli soldiers took the aforementioned civilian to his brother’s Belal (27) house. Belal was arrested after searching his house and Ibrahim was released. At approximately 02:00, Israeli forces moved into Kafr Ne’mah village, west of Ramallah. They raided and searched two houses, from which Mohammed Ahmed ‘Ali Naser (19) and Isma’il Saleh Isma’il al-Deek (19) were arrested. Israeli forces later withdrew taking them to an unknown destination. At approximately 02:30, Israeli forces moved into Halhoul, north of Hebron. They stationed in al-Camp area and then raided and searched a house belonging to ‘Emad Soliman al-Sa’dah. They arrested his two sons Soliman (16) and ‘Essam (14) and later withdrew taking them to an unknown destination. At approximately 13:30, Israeli forces directly opened fire at two Palestinians holding knives. The two Palestinian civilians attacked a military jeep parked in front of al-Hadawi Telecom shop, which is around 100 meters away to the north of Palestine Investment Bank on the main Street in Howarah village, south of Nablus. They were immediately killed. The Israeli soldiers claimed that the two aforementioned civilians attempted to stab soldiers; two of whom sustained minor wounds. The Israeli soldiers denied a Palestinian ambulance access to the scene and took the corpses to an unknown destination. The two killed persons were identified as Mohammed Rafiq Hasan Saba’nah (23) and Nour al-Deen Mohammed ‘Abdel Qader Saba’nah (17) from Qabatia, southeast of Jenin. Note: During the aforementioned day, Israeli forces carried out 5 incursions in the following areas without reporting any arrests: al-‘Aroub refugee camp; and villages of Sorif, al-Thaheriyah, Karisah and Amrish in Hebron. At approximately 00:30, Israeli forces moved into Deiristiya village, northwest of Salfit. They raided and searched two houses belonging to Hamed ‘Abdel Karim Sahban and Ra’ed Hamdan Mohammed Salman using tracker dogs. They soldiers asked the house residents for their ID cards and wrote down their numbers. Israeli forces later withdrew, but no arrests were reported. At approximately 01:30, Israeli forces moved into Yata, south of Hebron. They stationed in the areas of Roq’ah and al-Karmel. They then raided and searched a house belonging to Eyad Khalil Jabrin al-‘Amour (35). They arrested the aforementioned civilian and later withdrew taking him to where the military vehicles were stationed. Meanwhile, another Israeli force raided and searched a house belonging to Mohammed Hasan Badawi Abu ‘Aram and handed his 3 sons Khaled (28), Ra’ed (27) and Monjed (26) summonses to refer to the Israeli Intelligence in “Gosh ‘Etzion” settlement, south of Bethlehem. At approximately 02:00, Israeli forces moved into Marah Rabah village, south of Bethlehem. They handed 5 young men summonses to refer to the Israeli Intelligence in “Gosh ‘Etzion” settlement, south of the city. The summoned persons were identified as Yaser ‘Ali al-Sheikh (23); ‘Emad Yousif al-Sheikh (18); Hamzah ‘Abdullah al-Sheikh (19); Murad ‘Abdel Halim Salhab (41) and ‘Ali Mohammed Salahat (28). Around the same time, Israeli forces moved into Nablus. They raided and searched a number of houses, from which 3 civilians were arrested. Israeli forces later withdrew taking them to an unknown destination. The three arrested persons were identified as ‘Abdel Hakim ‘Abdel Halim al-Sa’eh (22); ‘Abdel Rahim ‘Abdel Men’em Taysir al-Shakhshir (21), a student at Annajah National University and ‘Adel Jamil ‘Adel Fakhewi (22). At approximately 03:30, Israeli forces moved into Jenin. They raided and searched a house belonging to Nour al-Deen ‘Aziz Sadeq Shalabi (20) and arrested him. It should be mentioned that the Israeli forces opened fire at the aforementioned civilian on 11 December 2015 when he was in the vicinity of al-Jalamah military checkpoint, northeast of Jenin, under the pretext of opening fire at the soldiers. He fled from the area after being hit with live bullets to the abdomen and foot. At approximately 01:30, Israeli forces moved into Kafl Haris village, north of Salfit. They raided and searched 2 houses belonging to Ra’ed Fayez al-Qaq and Soliman Mohammed Abu Ya’qoub. Israeli forces later withdrew, but no arrests were reported. Around the same time, Israeli forces moved into ‘Azoun village, east of Qalqilya. They raided and searched a number of houses. They arrested 3 civilians and later withdrew taking them to an unknown destination. The arrested persons were idneitifed as Bahaa’ al-Deen Hussein Shabitah (19); Murad Saqer Salim (22) and Hayey Hamzah Dar Hussein (19). Around the same time, Israeli forces moved into Qabatyah village, southeast of Jenin. They raided and searched two houses belonging to Rafiq Hussein Mohammed Saba’nah (53) and Mohammed ‘Abdel Qader Saba’nah (47). The aforementioned civilians are the fathers of Mohammed and Nour al-Deen who were killed by Israeli forces in Howarah village, south of Nablus, on 27 December 2015. The Israeli forces took pictures of the two houses and then raided al-Saba’anah Divan, where they received condolences for their sons. The Israeli soldiers tore the pictures of Nour and Mohammed on the wall. At approximately 02:30, Israeli forces moved into Nablus. They raided and searched Ahrar Center for Prisoners Studies and Human rights in the fifth floor in al-Shantir building in the centre of the city. They confiscated the centre’s archive, 3 laptops, a computer desktop, TV, satellite receiver, fax, telephone and router. Israeli forces left an order to close the centre. They then raided and searched a number of houses and arrested Amir Mohammed Shtayyah (22) from his family house in Mo’tah Street. Israeli forces later withdrew taking him to an unknown destination. At approximately 03:00, Israeli forces moved into Bethlehem. They stationed in al-Karkafah in the centre of the city and then raided and searched the office of Zakat Bethlehem Central Committee in al-Ikhaa’ Islamic School after bursting the outside and inside doors. Mahmoud Khalifah, the committee’s treasurer, said that the Israeli soldiers raided the administration and accounting rooms after breaking the doors and then sawed the central safe and a smaller one. They confiscated files in it and storage units from 3 computers in addition to other files and documents. It should be mentioned that the aforementioned committee offers services to 1200 orphans and hundreds of poor families. At approximately 03:30, Israeli forces moved into Jenin and then stationed in al-Basatin neighbourhood in the centre of the city. They raided and searched a house belonging to the family of Asil Diaa’ Ra’ouf Zugheibi (20) and arrested him. In the afternoon, Israeli forces moved into al-Jalamah village, north of Jenin. They raided and searched a house belonging to Rami Hesham Nader Abu Farhah (20) and arrested him. At approximately 01:30, Israeli forces moved into Tarqoumia village, northwest of Hebron. They raided and searched 3 houses, from which 3 civilians were arrested and taken to an unkown destination. The arrested persons were identified as Hasan ‘Omer al-Moraqten (30); ‘Alaa\ Mazen Dababsah (27) and Ra’ef Mohammed Qabajah (29). At approximately 03:00, Israeli forces moved into Deir Samit village, southwest of Dura, southwest of Hebron. The Israeli soldiers accompanied with Israeli intelligence officers raided and searched a house belonging to Mohammed ‘Abdel Baset al-huroub (36). On 19 November 2015, Israeli forces opened fired and arrested the aforementioned civilian after he opened fire at a number of settlers in Gosh ‘Etzion settlement, south of Bethlehem. The engineering staff surveyed the house, and the force officer handed the prisoner’s father a notice to destroy the second floor in a 3-storey house of 150 square meters. The notice gives the family till 05 January 2015 to challenge the decision. At approximately 03:30, Israeli forces moved into Shweikah Suburb, north of Tulkarm. They raided and searched a house belonging to the family of Hamzah Ahmed ‘Abdel Karim Hamed (20) and arrested him. They then raided and searched a house belonging to the family of twin sisters Nadiah and Diana ‘Abdullah Ibrahim Khweilek (18). They arrested him. At approximately 04:30, Israeli forces moved into Tulkarm and then stationed in the southern neighbourhood in the city near the cemetery. They raided and searched a house belonging to Mohammed Yousif Hasan Salman (39) and arrested him. They later withdrew taking him to an unknown destination. At approximately 18:00, Israeli forces moved into Barta’ah al-Sharqiyah village, which is isolated by its surroundings due to the annexation wall, west of Jenin. They raided and searched a house belonging to Mohammed Nabil Ahmed Qabha (38) and arrested him. The Israeli soldiers raided and searched a house belonging to ‘Isam Rateb ‘Abdel Latif Qabha (22) and arrested him as well. The Israeli soldiers later withdrew taking the arrested persons to an unknown destination. Note: During the aforementioned day, Israeli forces carried out 7 incursions in the following areas without reporting any arrests: villages of al-Samou’a, Tafouh, Ethna, al-Mowareq, al-Koum and al-Rosh al-Tahta. On Thursday, 17 December 2015, dozens of young men gathered in al-Qat’a area south of Beit Loqia village, southwest of Ramallah, and threw stones towards the annexation wall. Due to this, Israeli forces stationed at the area fired live ammunition, rubber-coated metal bullets, tear gas canisters and sound bombs at the protesters and chased them into agricultural fields. As a result, two children were hit with live bullets to the lower limbs. Moreover, the Israeli soldiers arrested Abed al-Qader Salah Abed al-Qader Shalabi (15), after beating him with gun butts and kicking him throughout his body. Abed al-Qader was handcuffed and then taken to an investigation room established at the checkpoint, where the soldiers asked him about the stone-throwers and then beat him up. The soldiers took Abed al-Qader to Benjamin Police Station, southeast of Ramallah. At approximately 02:00, the Israeli forces released Abed al-Qader on bail estimated at NIS 1,000 until his trial on 05 April 2016. On Thursday, after the announcement of Abdullah Nasasra’s death from Beit Foreek village, east of Nablus, a number of young men gathered and headed to a military camp established in al-Qa’da Mountain near “Itamar” settlement, east of the village. The protesters threw stones and empty bottles at the camp, due to which, the soldiers fired live and rubber-coated metal bullets at the protesters and chased them into the olive fields. As a result, two children were wounded with rubber-coated metal bullets. Following the Friday prayer, on 18 December 2015, dozens of young men gathered at the western entrance of Selwad village, northeast of Ramallah, in protest against the Israeli policies. The protesters set fire to rubber tires and threw stones and Molotov cocktails at the soldiers. Due to this, the soldiers fired live bullets, rubber- coated metal bullets and tear gas canisters at the stone-throwers and chased them into the village. At approximately 16:30, the soldiers opened fire at a private vehicle, due to which, the driver Mohammed Abed al-Rahman Ahmed ‘Ayad (21). The Israeli forces claimed that Mohammed carried out a run-over attack against a number of Israeli Border Guard officers stationed at the entrance. After that, the Israeli forces closed the area and prevented a Palestinian ambulance from rescuing the wounded person. Therefore, dozens of young men made their way to the area and threw stones at the soldiers. Soon after, the soldiers called for backup forces, so 3 Magen David Adom (MDA) ambulances arrived at the area. An eyewitness said to a PCHR’s fieldworker that the MDA ambulance crew offered medical treatment to the wounded soldiers while they left the young man bleeding to death. The corpse of the young man was then taken by the Israeli ambulance to an unknown destination. Following the Friday prayer, a peaceful demonstration started in front of the Beit Foreek mosque, northeast of Nablus, to a military camp established in al-Qa’da Mountain near “Itamar” settlement, east of the village. The protesters threw stones and empty bottles at the camp, due to which, Israeli soldiers fired live and rubber- coated metal bullets at the protesters and chased them into the agricultural fields. As a result, five civilian, including two children, were hit with live bullets. They were then taken to Rafidia hospital in Nablus to receive medical treatment. At approximately 13:30, dozens of young men gathered at the entrance of Beit ‘Aynoun village, east of Hebron, where Israeli forces deployed in the street after closing it with an iron gate. The protesters threw stones at the soldiers and set fire to rubber tires. Due to this, the soldiers deployed and topped the houses roofs and heavily fired live ammunition and tear gas canisters at the protesters. As a result, an 18-year-old male was hit with a live bullet to the head and was then taken by RPCS ambulance to al-Ahli hospital. Medical sources classified his injury as serious. On Friday, a protest was organized in al-Taweel mountain adjacent to “Psagot” settlement, east of al-Bireh, and at the southern entrance of al-Jazloun refugee camp, north of Ramallah. It should be mentioned that no arrests were reported. On Saturday, 19 December 2015, dozens of young men gathered at the eastern entrance of Senjel village, north of Ramallah. The village entrance was closed with cement cubes by the Israeli forces after the funeral of Nash’at Jamal ‘Asfour (34), who was killed on the previous day. The protesters threw stones at the soldiers, who fired live ammunition, rubber-coated metal bullets, tear gas canisters and sound bombs against the protesters in response. As a result, many civilians suffered tear gas inhalation, one of whom was an elderly woman namely ‘Aziza Mahmoud Shabana (71). The abovementioned woman was then taken to Palestine Medical Complex to receive medical treatment. At approximately 09:30 on Monday, 21 December 2015, a number of young men headed to al-Mountar gate near the annexation wall, west of Jayyous village, northeast of Qalqilia. The protesters threw stones and empty bottles at the soldiers, who fired live ammunition, rubber-coated metal bullets and sound bombs at them in response. As a result, Mohammed Abed al-Qader Abed al-Rahim Saleem (13) was hit with rubber-coated metal bullets to the head and the right leg. After that, Mohammed was taken to Dr. Darwish Nazal hospital in Qalqilia to receive medical treatment. At approximately 11:20 on Monday, a group of Palestinian young men gathered at the western entrance of Selwad village, northeast of Ramallah. The protesters threw stones at the soldiers stationed in the area, due to which, the soldiers fired three live bullets at the protesters. As a result, a 14-year-old male was hit with a live bullet that entered his right arm and exited the right side of his chest. The abovementioned male suffered severe bleeding, due to which, the Palestinian medical crew offered him medical aid. After that, he was taken by an ambulance to one of the Israeli hospitals in Israel. At approximately 11:30, dozens of Palestinian young men gathered in “Natanya” street near Gishori factories, west of Tulkarm. When the protesters approached the factories, Israeli forces moved into the area and the western lands of the Palestine Technical University “Khadouri”. After which, the Israeli forces heavily fired tear gas canisters at the protesters, who threw stones and Molotov cocktails at the soldiers in response. As a result, a 15-year-old male was hit with a live bullet to the right leg. Following the Friday prayer, 25 December 2015, a number of young men gathered in the center of Beit Foreek village, east of Nablus. The protesters then headed to an Israeli military camp established in al-Qa’da Mountain near “Itamar” settlement, east of the village, and threw stones and empty bottles at the soldiers. Due to this, the soldiers fired live ammunition and rubber-coated metal bullets at the protesters and chased them into agricultural fields. As a result, five civilians, including four children, were wounded. Two of them were hit with live bullets while the three others were hit with rubber-coated metal bullets. On Friday, dozens of young men gathered at the southern entrance of al-Jalzoun refugee camp, north of Ramallah, near an UNRWA school for boys, 300 meters away from “Beit Eill” settlement fence. The protesters gathered to organize a demonstration in protest at the Israeli attacks in the oPt. They then threw stones at the fence, due to which, the Israeli soldiers fired live ammunition, rubber-coated metal bullets, tear gas canisters and sound bombs at the protesters and chased them into the camp. As a result, two civilians were wounded. The first (24) was hit with a rubber-coated metal bullet to the right thigh, while the other (22) was hit with a live bullet to the left shoulder. In the afternoon, dozens of Palestinian young men gathered in the vicinity of Ofer prison, west of Ramallah, to organize a demonstration against the Israeli policies. The protesters then made their way towards the prison gate, due to which, the Israeli forces closed the gate and deployed in the area. After that, the protesters set fire to rubber tires and threw stones and empty bottles at the Israeli soldiers. Due to this, the soldiers immediately fired live ammunition, rubber-coated metal bullets, sound bombs and tear gas canisters at the protesters. As a result, four civilians were wounded, two of whom were hit with live bullets, while the two others were hit with rubber-coated metal bullets. At approximately 17:00 on Sunday, 27 December 2015, dozens of young men from ‘Azoun village, east of Qalqilia, gathered in front of the village entrances in protest at the arrest of Kariman Swidan. Due to this, Israeli soldiers fired sound bombs, tear gas canisters and rubber-coated metal bullets at the protesters. As a result, two civilians, including a child, were wounded with rubber-coated metal bullets. At approximately 17:00 on Monday, 28 December 2015, dozens of young men from ‘Azoun village, east of Qalqilia, gathered in front of the village entrances in protest at the arresting of Kariman Swidan. Due to this, Israeli soldiers fired sound bombs, tear gas canisters and rubber-coated metal bullets at the protesters. As a result, 2 civilians were wounded. One of whom was hit with 2 live bullets to the right knee, while the other was hit with a rubber-coated metal bullet below the abdomen. At approximately 14:30 on Thursday, 17 December 2015, dozens of Palestinian young men headed to the border fence between the Gaza Strip and Israel, east of al-Bureij refugee camp in the center of the Gaza Strip. The protesters threw stones at the soldiers stationed behind the sand barriers along the fence, due to which, the Israeli soldiers opened fire at them. As a result, Yousef Yasir Mohammed Thabet (13) was hit with a live bullet to the legs. The aforementioned wounded male was then taken to al-Aqsa hospital in Dir al-Balah to receive medical treatment. Medical sources in the hospital classified his injuries as moderate. At approximately 13:00, on 18 December 2015, dozens of Palestinian young men headed to the border fence between the Gaza Strip and Israel, east of al-Shuja’ia neighborhood, east of the Gaza Strip. A number of protesters approached the fence, set fire to rubber tires and threw stones at the Israeli forces stationed along the fence. Due to this, the Israeli forces sporadically fired live ammunition and tear gas canisters at the protesters. As a result, 10 civilians were wounded, eight of whom were hit with live bullets, while the two others were hit with rubber-coated metal bullets. At approximately 13:30, dozens of Palestinian young men headed to the border fence between the Gaza Strip and Israel, east of al-Bureij refugee camp in the center of the Gaza Strip. The protesters threw stones at the soldiers stationed behind the sand barriers along the fence, due to which, the Israeli soldiers opened fire at them. As a result, 14 protesters, including two children, a journalist and Palestine TV driver, were wounded. The journalist, Raed Fawaz Ibrahim Mosleh (24), who works at al-Tahreer Press, was hit with a live bullet to the right arm, while the driver, Yosri Mahmoud Ahmed al-Rayyes (37) was hit with a live bullet to the left leg. At approximately 14:00, dozens of youngsters headed to the border fence between the Gaza Strip and Israel, east of al-Faraheen area, east of Khan Younis, south of the Gaza Strip. A number of protesters approached the border fence, set fire to rubber tire, raised the Palestinian flags and threw stones at the soldiers stationed along the fence. Due to this, the Israeli soldiers sporadically fired live ammunition and tear gas canisters at the protesters until the evening. As a result, one of the protesters was killed while four others were wounded to the lower limbs when they were present 200-400 meters away from the border fence. The victim was identified as Mahmoud Mohammed Sa’ied al-Agha (23). At approximately 16:00, Mahmoud was directly hit with a live bullet that entered his forehead and then exited the back of his head when he was present 300 meters away from the border fence. Mahmoud was then taken to the European hospital, where doctors did all their efforts to save his life, but medical sources announced his death later. According to a PCHR’s fieldworker, al-Agha was in civilian clothes. However, al-Qassam Brigades (the armed wing of Hamas movement) issued a statement mourning al-Agha, as he was a member in al-Qassam Brigades and was killed during clashes in the east of Khan Younis. At approximately 14:30, Israeli forces stationed at Beit Hanoun (Erez) Crossing, northwestern of Beit Hanoun, north of the Gaza Strip, fired live ammunition, rubber-coated metal bullets and tear gas canisters at dozens of young men, who were on the road between the Palestinian and Israeli sides of the crossing. The protesters threw stones at the soldiers in protest at the Israeli attacks against the Palestinian civilians in Jerusalem and the West Bank. As a result of the clashes which continued until 17:30, 2, civilians were wounded with live bullets to the lower limbs of their bodies. Around the same time, Israeli forces stationed in watchtowers, north of Beit Hanoun, opened fire at dozens of young men gathered in the area. As a result, two civilians, including a child, were wounded. One of them was hit with a live bullet, while the other was hit with a rubber-coated metal bullet. 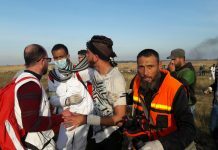 At approximately 16:00 on Sunday, 20 December 2015, dozens of young men headed to the border fence between the Gaza Strip and Israel, east of al-Bureij camp in the center of the Gaza Strip. The protesters threw stones at the soldiers stationed behind sand barriers along the fence, due to which, the soldiers opened fire at them. As a result, two protesters sustained wounds to their lower limbs. At approximately 15:00 on Tuesday, 22 December 2015, dozens of young men headed to the border fence between the Gaza Strip and Israel, east of al-Bureij refugee camp in the center of the Gaza Strip. The protesters threw stones at the soldiers stationed behind sand barriers along the fence, due to which, the soldiers opened fire at them. As a result, three protesters, including two brothers, were wounded with live bullets. One of them was a child. At approximately 13:30 on Friday, 25 December 2015, dozens of Palestinian young men headed to the border fence between the Gaza Strip and Israel, east of al-Shuja’ia neighborhood, east of the Gaza Strip. A number of protesters approached the fence, set fire to rubber tires and threw stones at the Israeli forces stationed along the fence. Due to this, the Israeli forces sporadically fired live ammunition and tear gas canisters at the protesters until 17:00 in the evening. As a result, Hani Tawfiq Wahdan (23) from al-Toffah neighbourhood was killed with a live bullet to the head, while 12 others, including three children, were wounded. Five of them were hit with live bullets, while the seven others were hit with rubber-coated metal bullets. At approximately 14:00, dozens of youngsters headed to the border fence between the Gaza Strip and Israel, east of al-Farahin area, east of Khan Younis, south of the Gaza Strip. A number of protesters approached the border fence, set fire to rubber tire, raised the Palestinian flags and threw stones at the soldiers stationed along the fence. Due to this, the Israeli soldiers sporadically fired live ammunition and tear gas canisters at the protesters until the evening. As a result, six civilians, including four children, were wounded with live bullets to the lower limbs of their bodies. At approximately 14:30 on Friday, Israeli forces stationed at Beit Hanoun (Erez) Crossing, northwestern of Beit Hanoun, north of the Gaza Strip, fired live ammunition, rubber-coated metal bullets and tear gas canisters at dozens of young men, who were on the road between the Palestinian and Israeli sides of the crossing. The protesters threw stones at the soldiers in protest at the Israeli attacks against the Palestinian civilians in Jerusalem and the West Bank. As a result of the clashes, which continued until 17:30, two civilians were wounded with live bullets to the lower limbs of their bodies. At approximately 15:00, dozens of young men headed to the border fence between the Gaza Strip and Israel, east of al-Bureij camp in the center of the Gaza Strip. The protesters threw stones at the soldiers stationed behind sand barriers along the fence, due to which, the soldiers opened fire at them. As a result, four civilians were wounded with live bullets and then were taken to Deir al-Balah hospital, where medical sources classified the injuries of one of them as serious. The abovementioned wounded person was identified as Yousef Mobarak Beheri Abu Sbaikha (49) from al-Maghazi, who was hit with 2 live bullets to the abdomen and the left thigh. Yousef was present in a plot of land, which is about 300 meters away from the border fence. At approximately 03:00 on Monday, 28 December 2015, medical sources declared the death of Yousef as he succumbed to his injuries. Following the Friday prayer, 18 December 2015, Palestinian civilians from Bil’in and Ni’lin villages, west of Ramallah; and al-Nabi Saleh village, northwest of the city, organized a peaceful demonstration in protest against the annexation wall and settlement activities. No arrests were reported. At approximately 15:00 on Saturday, Palestinian civilians and Israeli and international human rights defenders organized a protest in the center of Kufor Qaddoum village, northeast of Qalqilia, and made their way to the eastern entrance of the village in protest against closing that entrance since the beginning of al-Aqsa Intifada with an iron gate. When the protesters approached the entrance, Israeli forces fired live ammunition at them. As a result, a 17-year-old male was hit with a live bullet to the left knee and with a rubber-coated metal bullet to the left thigh. At approximately 12:30 on Friday, 25 December 2015, Palestinian civilians and Israeli and international human rights defenders organized a protest in the center of Kufor Qaddoum village, northeast of Qalqilia, and made their way to the eastern entrance of the village in protest against closing that entrance since the beginning of al-Aqsa Intifada with an iron gate. When the protesters approached the entrance, Israeli forces fired live ammunition, rubber-coated metal bullets, sound bombs and tear gas canisters at the protesters. As a result, a 15-year-old male was hit with a live bullet to the left thigh. Note: following the Friday prayer, 25 December 2015, peaceful demonstrations were organized in protest against the annexation wall and settlement activities, but no arrests were reported. The demonstrations were organized in the following villages: Bal’in and Ni’lin, west of Ramallah, and al-Nabi Saleh, northwest of Ramallah. On Wednesday, 16 December 2015, Israeli forces allowed the exportation of 160 tons scrap, 0.6 tons of fish and 25 tons of stationery. On Thursday, 17 December 2015, Israeli forces allowed the exportation of 12.8 tons of eggplants; 19.68 tons of cucumbers; 6.24 tons of palms; 2.73 tons of peppers; 9.28 tons of cabbages; 4 tons of sweet peppers; 12.39 tons of strawberries; 1.24 tons of cherry tomatoes and 9.88 tons of squashes. On Sunday, 20 December 2015, Israeli forces allowed the exportation of 5 truckloads of strawberries; a truckload of spices; 9 truckloads of vegetables; a truckload of eggplant and a truckload of stationery. On Monday, 21 December 2015, Israeli forces allowed the exportation of 160 tons of scrap; 0.35 tons of garlic and 0.72 tons of mints. On Tuesday, 22 December 2015, Israeli forces allowed the exportation of a truckload of strawberries; a truckload of eggplant and 8 truckloads of vegetables. On Wednesday, 24 December 2015, Israeli forces allowed the exportation of 160 tons of scrap; a truckload of fish and a truckload of spices. On Thursday, 24 December 2015, Israeli forces allowed the exportation of a truckload of cloths; a truckload of eggplants; 3 truckloads of strawberries and 3 truckloads of vegetables. On Sunday, 27 December 2015, Israeli forces allowed the exportation of a truckload of peppers; 2 truckloads of eggplants; a truckload of spices and 5 truckloads of vegetables. On Monday, 28 December 2015, Israeli forces allowed the exportation of a truckload of strawberries. BeitHanoun (Erez) crossing, in the north of the Gaza Strip, is designated for the movement of individuals, and links the Gaza Strip with the West Bank. On Friday, 18 December 2015, Israeli authorities allowed 183 civilians from the Gaza Strip to perform prayers in al-Aqsa Mosque in Occupied Jerusalem. On Friday, 25 December 2015, Israeli authorities allowed 200 civilians from the Gaza Strip to perform prayers in al-Aqsa Mosque in Occupied Jerusalem. On Wednesday, 16 December 2015, Israeli authorities allowed 1 person working in an international organization to renew his permit. On Sunday, 27 December 2015, Israeli authorities allowed 1 person working in an international organization to renew his permit. On Sunday, 20 December 2015, Israeli authorities allowed 16 Christians to travel to Bethlehem to celebrate the Christmas. On Monday, 21 December 2015, Israeli authorities allowed 17 Christians to travel to Bethlehem to celebrate the Christmas. On Tuesday, 22 December 2015, Israeli authorities allowed 34 Christians to travel to Bethlehem to celebrate the Christmas. On Wednesday, 23 December 2015, Israeli authorities allowed 83 Christians to travel to Bethlehem to celebrate the Christmas. On Thursday, 24 December 2015, Israeli authorities allowed 80 Christians to travel to Bethlehem to celebrate the Christmas. On Friday, 25 December 2015, Israeli authorities allowed 31 Christians to travel to Bethlehem to celebrate the Christmas. On Sunday, 27 December 2015, Israeli authorities allowed 16 Christians to travel to Bethlehem to celebrate the Christmas. On Monday, 28 December 2015, Israeli authorities allowed 8 Christians to travel to Bethlehem to celebrate the Christmas. On Monday, 25 December 2015, Israeli authorities allowed 1 person working in the Public Authority for Civil Affairs to attend a meeting in Israel. Hebron: Israeli forces established (62) checkpoints all over the city. On Thursday, 17 December 2015, the Israeli forces established seven checkpoints at the entrances of Ethna village; Beit Ummer village; Sa’ir village; al-‘Aroub and al-Fawar refugee camps; the northern entrance of Hebron and the northern entrance of Halhoul village. On Friday, 18 December 2015, Israeli forces established three checkpoints at the entrances of Sa’ir village; al-Fawar refugee camp, south of Hebron and the northern entrance of Hebron. On Saturday, 19 December 2015, Israeli forces established four checkpoints at the entrance of al-Fawar refugee camp, south of Hebron; the northern entrance of Hebron; the northern entrance of Halhoul village and at the intersection of Sa’ir village. On Sunday, 20 December 2015, Israeli forces established 6 checkpoints at entrances of Ethna village; Beit Ummer village; Sa’ir village; al-Fawar refugee camp, south of Hebron; the northern entrance of Hebron; and the northern entrance of Halhoul village. On Monday, 21 December 2015, the Israeli forces established five checkpoints at the entrances of Sa’ir village; al-Fawar refugee camp, south of Hebron; the northern entrance of Hebron; the northern entrance of Halhoul village and the northern entrance of Yatta village. On Tuesday, 22 December 2015; on Wednesday, 23 December 2015; and on Thursday, 24 December 2015, Israeli forces established the same checkpoints in the abovementioned villages. On Friday, 25 December 2015, Israeli forces established six checkpoints at the entrances of Tarama village; al-Fawar refugee camp, south of Hebron; the southern and northern entrances of Hebron; the northern entrance of Halhoul village and at the intersection of Sa’ir village. On Saturday, 26 December 2015, Israeli forces established four checkpoints at the entrance of al-Fawar refugee camp, south of Hebron; the southern entrance of Hebron; the northern entrance of Halhoul village and at the intersection of Sa’ir village. On Sunday, 27 December 2015, Israeli forces established six checkpoints at the entrances of Beit Ummer village; Sa’ir village; Ethna village; al-Fawar refugee camp, south of Hebron; al-‘Aroub refugee camp, north of Hebron and the southern entrance of Hebron. On Monday, 28 December 2015, Israeli forces established 7 checkpoints at the entrances of Beit Ummer village; Sa’ier village; Ethna village; al-Fawar and al-‘Aroub refugee camps; north and south of Hebron; the southern entrance of Hebron and the northern entrance of Yatta village, south of Hebron. On the same day, Israeli forces established four checkpoints at the entrances of Sa’ir village; al-Fawar refugee camp, south of Hebron; al-‘Aroub refugee camp, north of Hebron and the southern entrance of Hebron. Ramallah and al-Bireh: Israeli forces established (11) checkpoints all over the city of Ramallah. On Thursday, 17 December 2015, Israeli forces established two checkpoints at the entrances of al-Nabi Saleh village, northwest of Ramallah, and the northern entrance of ‘Ein Sinaa village, north of Ramallah. On Friday, 18 December 2015, Israeli forces established 5 checkpoints at the entrances of al-Nabi Saleh village; Dir Abu Mesh’al village, northwest of Ramallah; ‘Atara bridge at the northern entrance of Birziet, under the bridge of Yabroud village, northeast of Ramallah and at the western entrance of Selwad village. On Saturday, 19 December 2015, Israeli Forces established three checkpoints at the northern entrance of ‘Ein Sinaa village, north of Ramallah; under the bridge of Kherbitha al-Mosbah village, southwest of Ramallah and the eastern entrance of al-Nabi Saleh village, northeast of Ramallah. At approximately 16:30 on Sunday, 20 December 2015, Israeli forces established a checkpoint near the intersection of Beit Our al-Foqa village, southwest of Ramallah. At approximately 10:30 on Friday, 18 December 2015, Israeli forces established a checkpoint near the entrance of Fasayel village, north of Jericho. Qalqilia: At approximately 11:00 on Thursday, 17 December 2015, Israeli forces established a checkpoint at the eastern entrance of Qalqilia. At approximately 15:30 on Friday, 18 December 2015, Israeli forces established the same checkpoint in the abovementioned area. On Saturday, 26 December 2015, Israeli forces established two checkpoints at the eastern entrance of Qalqilia and the intersection of Jeet village, northeast of Qalqilia. Salfit: Israeli forces established (13) checkpoints all over the city. At approximately 19:00 on Thursday, 17 December 2015, Israeli forces established a checkpoint between Kafel Hares and Deirestya villages, northwest of Salfit. At approximately 20:00, Israeli forces established a checkpoint between Kafel Hares and Hares villages, north of Salfit. On Saturday, 19 December 2015, Israeli forces established three checkpoints at the western entrance of Kufor al-Deek village; the northern entrance of Burqin village and the entrance of Dir Balout village, west of Salfit. On Thursday, 24 December 2015, Israeli forces established three checkpoints at the entrances of Kufor Hares village, north of Salfit; Burqin village and Kufor al-Deek village, west of Salfit. On Friday, 25 December 2015, Israeli forces established two checkpoints at the entrance of Deirestya village, northwest of Salfit, and at the western entrance of Kufor al-Deek village, west of Salfit. On Monday, 28 December 2015, Israeli forces established three checkpoints at the entrances of Kufor al-Deek village; Burqin village and Qarawat Bani Hassan village, west of Salfit. Tulkarm: At approximately 09:30 on Thursday, 17 December 2015, Israeli forces established a checkpoint at the intersection of Far’on village, south of Tulkarm. The Israeli soldiers stopped the vehicles traveling in both directions and checked the passengers’ IDs. When a 14-year-old child namely Hussain ‘Ahed Hussain Budair (14) was crossing the checkpoint, the soldiers detained him and questioned him on the spot. After that, the Israeli soldiers released Hussain and removed the checkpoint. No arrests were reported. At approximately 23:45 on Sunday, 20 December 2015, Israeli forces established a checkpoint on the main street between Tulkarm and Nablus, near the intersection of Bazaria village, east of Tulkarm. At approximately 08:30 on Tuesday, 22 December 2015, Israeli forces established a checkpoint at the entrance of Rameen village, northeast of Tulkarm. At approximately 20:00 on Thursday, 17 December 2015, Israeli forces established a checkpoint on the main street between Jenin and Ya’bad village, southwest of Jenin. At approximately 18:00 on Friday, 18 December 2015, Israeli forces established a checkpoint at the eastern entrance of Ya’bad village, southwest of Jenin. Note: all the above-mentioned checkpoints were removed later and no arrests were reported. At approximately 09:00 on Thursday, 17 December 2015, Israeli forces established a checkpoint at the entrance of Deirestya village, north of Salfit. The Israeli soldiers checked the passengers’ IDs and searched their vehicles. Additionally, they arrested Abed al-Karim Fares Shobita (22), from ‘Azoun village, east of Salfit. At approximately 08:45 on Saturday, 19 December 2015, Israeli forces stationed at Za’tara checkpoint, south of Nablus, arrested Asmaa Abed al-Hakim Wasif al-Qadeh (21), from Nablus, who is a student at Birzeit University. According to eyewitnesses, the Israeli soldiers stationed at the checkpoint stopped the taxi carrying al-Qadeh and checked the passengers’ IDs. After that, they asked Asma to get out of the taxi and stand on the right side of the checkpoint and then took her to an unknown destination. It should be mentioned that Asma is a daughter of the former prisoner, Abed al-Karim al-Qadeh. At approximately 14:00 on Monday, 21 December 2015, Israeli forces deployed at the entrance of Yatta village, south of Hebron, arrested Madleen Mohammed Taleb Hraizat (22), claiming that she had a knife in her bag. At approximately 15:00 on Monday, Israeli forces stationed at al-Za’im checkpoint, east of Jerusalem, arrested four civilians from al-‘Aroub refugee camp, north of Hebron, while they were attempting to enter Israel to find work. The abovementioned civilians were identified as Mousa Amjad al-Titi (18); Sharif Khadir al-Sharif (18); Khalid Salem Rushdi (20) and Haitham Yousef Abu Ghazi (22). At approximately 09:00 on Wednesday, 23 December 2015, Israeli forces stationed at the checkpoint established for more than 30 days at the northern entrance of Hebron, arrested Yousef Ghalib Katba (21) after they got him out of a vehicle. They then took him to an unknown destination. At approximately 14:00, Israeli Border Guard officers stationed at a military checkpoint between the western area of Hebron and al-Ibrahimi mosque, arrested Dalal Nafez Mohammed al-Qimary (23), from the south of Hebron, claiming that she had a knife. In the evening, Israeli forces stationed at al-Linbi Crossing between the West Bank and Jordan arrested Thaeir Mohammed Hassan Howati (26), from Jenin, as he was returning from Jordan. The arrested person was then taken to Hawarah police station, south of Nablus. At approximately 18:00 on Thursday, 25 December 2015, Israeli forces established a checkpoint at the entrance of Ya’bad village, southwest of Jenin. The soldiers stopped the vehicles travelling in both directions and checked the passengers’ IDs. After that, Israeli soldiers before removing the checkpoint arrested Naser Basam Mohammed Abu Baker (17), from Ya’bad village, while crossing the checkpoint. They then took him to an unknown destination. In the evening, Israeli forces stationed at the Container checkpoint, northeast of Bethlehem, arrested As’ad Yasser Ahmed Abu Tami’ (22), from Jenin, while crossing the checkpoint. At approximately 10:20 on Sunday, 27 December 2015, Israeli forces stationed at the eastern gate of ‘Azoun village, east of Qalqilia, arrested Kariman Akram Mohammed Swidan (14), claiming that she had a knife. The Israeli soldiers searched Kariman when returning from her school, east of the village. They then took her to an unknown destination. On Saturday morning, 19 December 2015, armed clashes erupted between Palestinians and Israeli forces stationed at Qalandia checkpoint, north of occupied Jerusalem. As a result, Fida’ Samir Kamel Shweiki (31) sustained a bullet wound to the left elbow. The wounded civilian was taken to Palestine Medical Complex in Ramallah to receive the necessary medical treatment. It should be noted that she lives in her house that is close to the aforementioned checkpoint. On Wednesday morning, 23 December 2015, 4 students from Hezmah village, northeast of occupied Jerusalem, sustained live bullet wounds. According to PCHR’s investigations, after the four students sat for the exams and left school from 09:00 to 09:30, Israeli forces opened fire at students under the pretext that Israeli soldiers stationed at entrances leading to Hezma village were stoned 5 weeks ago. Israeli forces arrested one of the students namely Salah Shebli Mohammed Ibrahim Askar (16), while the remaining others aging between 15 and 16 escaped although they sustained bullwt wounds in the lower limbs. They were then taken to Palestinian hospitals to receive the necessary medical treatment. At approximately 12:40, on the same day, two female Border Guard officers opened fire at two Palestinian young men namely Adnan Mohammed Saleh Hammad (Abu Habsah) (21) and Essa Yassin Yusef Assaf (21). The two aforementioned persons carried out a stabbing against three Israeli settlers near Hebron Gate, one of Jerusalem’s gates in the Old City in East Jerusalem. As a result, both of them were killed. Many videos posted on social media showed how Israeli police officers and settlers, including a Rabbi and intelligence officers, were kicking and insulting the 2 aforementioned persons. Moreover, someone hit one of the two wounded persons with an iron stick several times although the latter was wounded and fainted. After that, that person threw the stick on the ground and went away. Few minutes later, the Israeli police closed Jerusalem’s gates and Israeli officers deployed in the roads of the Old City. It should be noted that the two Palestinian persons are from Qalandia refugee camp, north of the city, and both of them carried the Palestinian Authority’s ID, which does not allow the entry into Jerusalem unless by permits from the Israeli forces. On Thursday afternoon, 24 December 2015, Israeli forces stationed at Jaba’ checkpoint near the northern entrance to al-Ram village, north of occupied Jerusalem, opened fire at a Palestinian civilian car. As a result, the driver Wesam Nasser Abdul Hadi Abu Ghwailah (20), from Qalandia refugee camp, north of the city, was killed. Israeli forces claimed that the aforementioned person tried to run over Israeli soldiers in the place. The Wesam’s corpse was taken to an unknown destination. On the same day also, following the killing of Wesam Abu Ghwailah, Israeli forces moved into Qalandia refugee camp, north of Jerusalem, where dozens of Palestinian young men gathered and threw stones and empty bottles at Israeli soldiers. Due to that, Israeli forces opened fire at them and chased them into the streets. As a result, Belal Omer Jamal Zayed (25) sustained a bullet wound to the face (underneath the left eye). He was then taken by a PRCS ambulance to Palestine Medical Complex in Ramallah to receive the necessary medical treatment, but he passed away on his way to the hospital. Moreover, gunfire resulted in the injury of four others, including 2 children. They sustained live bullet wounds and were then taken to the same Medical Complex. On Friday afternoon, 25 December 2015, dozens of Palestinian youngsters gathered on the outskirts of Qalandia refugee camp, north of Jerusalem, and threw stones and empty bottles at Israeli soldiers stationed around Qalandia military checkpoint. Israeli soldiers opened fire in response. As a result, two civilians sustained live bullet wounds to their lower limbs. They were taken by PRCS ambulances to Palestine Medical Complex in Ramallah to receive the necessary medical treatment. On the same day, dozens of Palestinian youngsters gathered on the outskirts of ‘Anata village, northeast of Jerusalem, and threw stones and empty bottles at Israeli soldiers stationed in the area. Israeli soldiers opened fire in response. As a result, a Palestinian civilian sustained a bullet wound to the left thigh and was then taken by a PRCS ambulance to Palestine Medical Complex in Ramallah to receive the necessary medical treatment. At approximately 09:40 on Saturday, 26 December 2015, an Israeli police officer opened fire at Mos’ab Mahmoud al-Ghazali (26), from Qaddoum valley neighbourhood in Silwan village, south of al-Aqsa mosque, under the pretext that he attempted to stab Israeli police officers in front of al-Jadid Gate, one of Jerusalem’s gates, near Jaffa Street in West Jerusalem. As a result, Mos’ab was shot dead by several bullet wounds to his feet and chest. An eyewitness said to PCHR’s fieldworker that al-Ghazali was standing near a traffic light at the said intersection after Israeli police officers ordered him to stand up as he was sitting on a bench in the yard opposite to al-Jadid Gate, during which, they heavily opened fire. They first opened fire at his feet and then at his chest. At approximately 04:00 on Thursday, 17 December 2015, a large force of Israeli police and intelligence officers raided a house belonging to the family of Abeer Ahmed Othman Zeyad (39), in al-Thawri neighbourhood, south of East Jerusalem’s Old City. They searched the house thoroughly and confiscated cell phones, files and personal belongings. They then raided a women’s centre run by the aforementioned woman, which is near her house. Soon after, they arrested her and handed a summons over to her husband to refer to al-Masqoubiyah detention facility at 10:00, the next day. It should be noted that Mrs. Abeer has 4 children and was arrested by Israeli forces several times. Moreover, she is a member in Fatah movement in Jerusalem. At approximately 10:00 on the same day, Israeli forces arrested two Palestinian children while sitting on al-Amoud Gate stairs and chanting national songs. They were both taken to Saladin police station for interrogation. The two arrested persons were identified as Mostafa Isma’il Abu Salb (10) and Mohammed Ra’ed Abu Qalbain (13). At approximately 04:00 on Monday, 21 December 2015, Israeli forces moved into al-Mukaber Mountain village, southeast of East Jerusalem. They raided and searched a number of houses from which they arrested four civilians, including 3 children. The arrested civilians, who were taken to “Oz” facility to be questioned, were identified as Yassin Fo’ad al-Qunbur (19), Ali Khaled Hussein Ewaysat (16), Ahmed Khaled Ewaysat (16) and Mousa Ra’ed Khader (15). At approximately 11:00, on the same day, Israeli forces arrested Samer Ahmed Abu Eisha while being present around his house in the Old City in East Jerusalem. They took him to al-Masqoubiya detention facility in West Jerusalem. They handed him an order to deny him access to Jerusalem for 5 months. The order issued on 16 December 2015 reads the following, “According to article 6, 108 and 109 of the 1945 Defence (Emergency) Regulations, to maintain the security of State and discipline and safety of society, an order was issued to deport Samer Abu Eisha from Jerusalem until 15 July 2016”. It should be noted that Abu Eisha was arrested few months ago and subjected to tough interrogation at al-Masqoubiya detention facility for 33 days. He was then released, but placed under house arrest and denied traveling abroad until the legal and judicial procedures taken against him finish. At approximately 07:00 on Tuesday, 22 December 2015, Israeli forces arrested Ra’fat Mohammed Manasrah (28), from Bethlehem, while being present near al-Amoud Gate in East Jerusalem’s Old City, under the pretext that he had no permit to enter the city. At approximately 04:00 on Wednesday, 23 December 2015, Israeli forces moved into Abu Dees village, east of occupied Jerusalem. They raided and searched a house belonging to the family of Ahmed Khaled Ayad Halabiya (31). They then arrested the aforementioned person and took him to an unknown destination. At approximately 12:00, on the same day, Israeli forces arrested Ma’rouf Mohammed Mtour (16), while sitting near al-Amoud Gate stairs in East Jerusalem’s Old City. They took him to an unknown destination. At approximately 16:00, on the same day also, Israeli forces moved into Om Touba village, southeast of East Jerusalem. They provoked the Palestinian civilians and insulted some young men, who returned the insults. During which, a number of undercover members “Mosta’rebeen” stepped out of a car and then beat and arrested 3 young men, including a child. The arrested persons were identified as Yasser Amin Abu Tair (15), Ahmed Amin Abu Tair (20) and Mo’taz Mostafa Abu Tair (19). At approximately 19:00, Israeli forces raided and searched a house belonging to the family of Naji Eweisat in al-Mukaber Mountain village, southeast of occupied Jerusalem. They arrested his son Nader (16) and took him to an unknown destination. At approximately 04:00 on Thursday, 24 December 2015, Israeli forces moved into al-Mukaber Mountain village, southeast of occupied Jerusalem. They raided and searched a number of houses, from which they arrested Majd Ewaisat (16) and Alaa Abdu (17). At approximately 10:00, Israeli forces arrested Samer Ahmed al-Rajabi (24) and Jalal Khader Froukh (21) near al-Asbat Gate in East Jerusalem’s Old City. At approximately 13:00, Israeli forces arrested Tawfiq Mohammed Abu Dheim (15) and Omer Mahdhar (19) from in front of the Israeli District Court on Saladin Street in the centre of East Jerusalem. At approximately 15:00 on Saturday, 26 December 2015, hundreds of Palestinian civilians formed the longest human chain around Jerusalem’s walls under the slogan “Restoring Bodies is Right and Dignity” requesting the release of Palestinians who were killed and have been in the Israeli custody as part of the Israeli collective punishment policy imposed on their families. The participants raised portraits of Jerusalemite killed persons that have been in the Israeli custody for weeks. The first of them was Tha’er Abu Ghazala, who was killed on 08 October 2015, and the last one was Mos’ab Mahmoud al-Ghazali, who was killed on 26 December 2015. Moreover, the participants raised names of those killed persons, slogans calling for the importance of recovering them and Palestinian flags. The chain started at al-Saherah Gate passing through Sultan Suleiman Street and al-Amoud Gate area. Once the chain headed towards al-Amoud Gate area, Israeli Special Forces started firing sound bombs and tear gas canisters, while the cavalry officers chased them in the streets. As a result, a young man and a woman suffered tear gas inhalation and Ayman a-Takrouri (21) was arrested. At approximately 09:00 on Sunday, 27 December 2015, Israeli police officers arrested Sa’id Malek Qumbuz (29), from al-Eizariya village, east of Jerusalem. They claimed that Qumbuz stabbed an Israeli soldier near the central bus stop in West Jerusalem, due to which the soldier’s wounds ranged between minor and moderate. At approximately 11:00 on Monday, 28 December 2015, Israeli forces moved into al-Eisawiya village, northeast of East Jerusalem. They arrested Mohammed Ali Dawood Derbas (10) from in front of his family house. They then took him to Saladin police station for interrogation. At approximately 02:00 on Tuesday, 29 December 2015, Israeli forces moved into Kufor Aqeb village, north of occupied Jerusalem. They raided and searched a number of houses from which they arrested three civilians, including a child. The arrested persons were identified as Emad Nour al-Deen al-Zgheer (14), Hani al-Tamimi (19) Mo’men Yasser al-Qaz’ah (21). The 12-member family of Rami Sa’id Maswadi and his brother Tawfiq. Their house is 42 square meters. The settlement organizations claimed in the lawsuits that the Palestinian families are not protected, as persons of the third generation passed away and there are changes in the premises. In Aqabet al-Khalidiya there is intensive settlement activity, as settlement organizations are active in seizing Palestinian houses as they depend on laws and documents claiming that the Palestinian houses belong to Jews before 1948. In the same area there is a house belonging to Sab Laban family, as the Israeli Magistrates Court ruled vacating the house in favour of settlements two months ago. Moreover, there are a number of settler houses and a synagogue in the same neighbourhood. The settlement organizations bring extremist settlers to live in such neighbourhoods. At approximately 09:00 on Tuesday, 22 December 2015, Israeli forces vacated a premises belonging to Hussein al-Qaisi in Aqabet al-Saraya neighbourhood in East Jerusalem’s Old City, claiming that it belongs to settlers. An eyewitness said to PCHR’s fieldworker that Israeli forces raided a premises belonging to Hussein al-Qaisi and took some of its contents outdoors. They then changed the locks and arrested the premises owner. He added that the settlers claimed that it belongs to them since before 1948. It should be mentioned that this premises is a part of a building that was seized by settlers in the past years. The eyewitness said the premises is a commercial facility that was turned years ago into a house in which al-Qaisi used to live. At approximately 04:00 on Monday, 28 December 2015, the Israeli authorities handed a house demolition notice over to Mohammed Amirah to demolish his house that is located in al-Hommos valley neighbourhood in Sour Baher village, southeast of occupied Jerusalem, under the pretext of non-licensing. The aforementioned person said to PCHR’s fieldworker that Israeli forces raided his house and handed him over an order signed by Nir Barakat, the Israeli Municipality Mayor, to demolish Amirah’s house. He added that officers from the Israeli municipality and Israeli Ministry of Interior have been chasing him for two months after he finished building his house and lived in it, as many demolition notices were issued. Mohammed said that his 160-square-meter house cost him NIS 350,000. He started building the house a year ago and lately moved in. Amirah explained that he, his wife and their four children; the eldest of whom is 11 and the youngest is one year old, live in the house. He stressed that he built the house on his own piece of land, but the Israeli municipality refuses to issue him a construction license. At approximately 07:00 on Tuesday, 29 December 2015, the Israeli municipality bulldozers demolished an under- construction building in Hommos valley neighbourhood in Sour Baher village, southeast of occupied Jerusalem, under the pretext of non-licensing. This building belongs to Ra’ed Raja Rabay’ah. Rabay’ah said to PCHR’s fieldworker that Israeli forces accompanied by municipality officers and bulldozers moved into Hommos valley neighbourhood in Sour Baher village. They surrounded the area and closed the streets. In the meantime, the bulldozers started demolishing the under-construction building without notice. He added that he started building it two months ago. The 2-storey building has cost him NIS 170,000 so far. At approximately 17:00 on Tuesday, 29 December 2015, Israeli forces raided a house belonging to the family of Alaa Abu Jamal in al-Mukaber Mountain village, southeast of occupied Jerusalem. They handed an order over to his family to vacate the house in 48 hours to be demolished. Abu Jamal’s family said that Israeli forces handed an order over to them to demolish the house. The family added that the order was issued by the Home Front Command and approved by the Israeli High Court. They explained that Israeli forces decided to demolish a house belonging to Safa’ Abu Jamal, Alaa’s sister, claiming that they had classified information that the aforementioned 3-storey house belongs to Alaa. The family added that the Israeli forces refused to consider the family petition that confirms the house threatened to be demolished is Safa’s. The Israeli authorities claimed that had classified information in this regard. The threatened house is inhabited by 4 members: Safa’, her husband and their two children. The second floor is inhabited by Alaa’s father, mother and his 7 siblings. In the third floor lives one of Alaa’s brothers and his child. The family pointed out that the Israeli municipality had issued an administrative demolition order against Alaa’s house, which is the same house that received a confiscation and demolition order from the Home Front Command, taking in consideration that the house was built in 1995. The family had filed a petition before the Israeli High Court, but it was rejected. It should be noted that Alaa Abu Jamal was killed by Israeli forces after he carried out a run-over and stabbing attack that resulted in the killing of an Israeli Rabbi on 13 October 2015. On Saturday evening, 26 December 2015, a group of settlers attempted to kidnap and kill Enas Syori (23) while she was going back home in occupied Jerusalem. She was coming from Beit Hanina village and going home before she got lost around “Ramot” Street, near Shu’fat village. The aforementioned woman was surprised to see a number of masked settlers attacking her. They smashed her car windows and attempted to strangulate her. They then obliged her to step out of her car. Her husband Samer Syori said that one of the attackers attempted to strangulate Enas, but she could run away after she took off her coat that was held by one of the settlers. In the meantime, the settlers fired a number of bullets at her, but she was not hurt. Samer added that they have a baby. Enas was admitted to Hadassa-al-Eisawiya Hospital, where doctors found that she sustained bruises in the neck. Moreover, she still suffers from trauma. Samer explained that the family filed a complaint before the Israeli police, but no substantial action was taken to prosecute the perpetrators. A 100-square-meter under-construction house belonging to Mos’ab Mohammed al-Batran. At approximately 10:00 on Monday, 28 December 2015, Israeli forces accompanied by an Israeli Civil Administration vehicle moved into al-Baq’ah area, east of Hebron. They stationed between the house, after which, the Civil Administration officer handed a notice over to Nemer Fahmi Jaber (38) to halt construction works in his 90-square-meter house under the pretext of building without a construction license in area (C). At approximately 01:30 on Tuesday, 22 December 2015, a group of settlers moved into al-Dhhour area, east of Beitlellow village, northwest of Ramallah, which is close to “Nahal’eil” settlement. They fired 2 gas canisters into a house belonging to Hussein Abed Hussein al-Najjar (32). The 2 canisters penetrated the kitchen window. As a result, Hussein’s wife and toddler suffered tear gas inhalation. Before withdrawing, the settler wrote in Hebrew a slogan on the walls of Hussein’s brother house nearby. “At approximately 01:30, on the abovementioned day, my wife Zainab (30), my son Karam (9 months) and I were asleep at home in al-Dhhour area, east of Beitellou village, northwest of Ramallah. I woke up hearing the sound of glass being smashed. When I opened the door, there was the strong smell of tear gas. We all suffered tear gas inhalation. I telephoned my brother Sharif (35), who lives around, and told him what was happening. I first thought it was the cooking gas cylinder in the kitchen. Sharif and some neighbours arrived. I could hardly open the door for them. We then went out of the house to find an anti-Arab slogan in Hebrew on the back wall of Sharif’s house. We also saw the kitchen window smashed. Over 2 hours later and because of the strong smell of tear gas, we entered the house. We found 2 gas canisters in the kitchen, one of which was near the cooking gas cylinder. At approximately 06:00, Israeli forces and police officers arrived and inspected the area. They took photos of the house and the slogan and I gave then my testimony”.